438 (3). PARDON ROLL, Part 3. John Veer, earl of Oxford, viscount Bulbeke and lord of Scalys, Great Chamberlain and Admiral of England, 3 May. Thomas earl of Surrey, late treasurer of Exchequer, vicewarden of the East and Middle Marches, justice of forests beyond Trent, guardian of the lands of Sir Thomas Fenys lord Dacre in his minority, etc., tenant of lands which were of Frederic Tylney, esq., 4 May. George Talbot, earl of Shrewsbury, lord Talbot, Straunge, Fornevall and Verdon, steward of the Household, undated. Thomas Fynes, k., lord Dacre of the South, of Herstmounceux, Bukkeholt and Perpoundysherst, Suss., Sypton, Suff., and Horsford, Surr., 5 May. Robert Willughby, lord Broke, of Bereferrers, Devon, Broke, Wilts., Hoke, Dors., and Lambeth, Surr., s. and h. of Rob. W., k., late lord Broke, 15 May. George Nevyle, k., lord Bergevenny, of Merworth and Birling, Kent, London, Ewregge and Whalysbech, Suss., Nalyngton, Surr., and Stepenhith, Midd., 4 May. George Hastynges of Kerby and Assheby de Lazouche, Leic. and London, knight, lord Hastynges, s. and h. of Edward Hastynges, knight, late lord Hastynges and Hungerford, 8 May. Mary lady Hastynges, late the wife of Edward lord Hastynges and Hungreford, dec., widow, lady of Hungreford, Botreaux, Molens and Mulys, d. and h. of Thomas Hungreford, knight, s. and h. of Robert Hungreford, knight, and of Eleanor his wife, alias Mary lady Hastynges, executrix of Thomas Kebeel, executor of John Kebeel, late of Reresby, Leic., esq., 8 May. Ralph Langford, Longforth, Langforde or Longforthe, of Langforth, Derb., and Hoyth, Lanc., k., 12 May. Wm. Turpyn, of Knaptofte, Leic., Arthyngworth, Ntht., Astwod, Worc., London and Lincolns Inn, Midd., gent., executor of John Turpyn, undated. John Fortescu, of Pounesborne or Ponsborn, Herts, Falborune or Falkkeborune, Essex, and London, esq. (s. and h. of John F., of Pounesborne, k.) and Philippa his wife, d. and h. of Clement Spice and kinswoman and heir of Thomas Mongomere, k., and Alice Wyseman, 16 May. John Feld or Atfeld, of London, fishmonger, brewer or merchant, 10 May. Edward Darell or Darrell, of Lytelcote, Wilts, and London, k., undated. John Forde, of Doneat or Donet, Soms., Richmond, Surr., Greenwich, Kent, and London, y. or g., 15 May. Wm. Hastynges, of Chelsey, Midd., Asshby de la Zouche and Kyrby, Leic., esq., younger son of Wm. late lord Hastynges, dec., executor of Katharine Hastynges, dec., widow of the said lord H., and of Robert Moine, clk., dec., 29 April. Wm. Waldegrave, of Smalbregge, Burys or Burrys, Suff., k., 11 May. Wm. Page, of Hoxton and Shordiche, Midd., gent., Woldham, Kent, and London, late [one] of the tellers of the Exchequer, 5 May. Thomas Pulteney, of Misterton, Asshby de la Zouche, and Onlep, Leic., and Shenley, Herts, esq., kinsman and h. and executor of Thomas Pulteney, k., 10 May. Barth. Brokesby or Brokysby, of Frysby super Wreke, Leic., Bradley Magna, Suff., and London, esq., 8 May. John Reed, Rede, or Reyde, of Leicester, Asshby de la Zouche and Kyrby, Leic., and Braunsepeth, Dham., y., 4 May. Richard Pexsall, abbot (late cellarer and sub-cellarer) and the convent of St. Mary de Pratis, Leicester, 5 May. Heraldus Staunton, merchant of the Staple of Calais, late of Onlep, Leic., London and Bruges in Flanders, g. or merchant, 5 May. Fulk Wallewyn, Walwyn or Walwen, of Magna Marcle, Markehill or Helyns in Marcull, Heref., esq., 23 June. Anne Skerne, widow of Henry S., and Agnes Hamby, widow of Thomas H. and d. and h. of Wm. Langdale, tenants of two parts of Waltham manor, Linc., 12 June. John, the abbot, and the convent of Combyrmere, Chesh., 12 June. 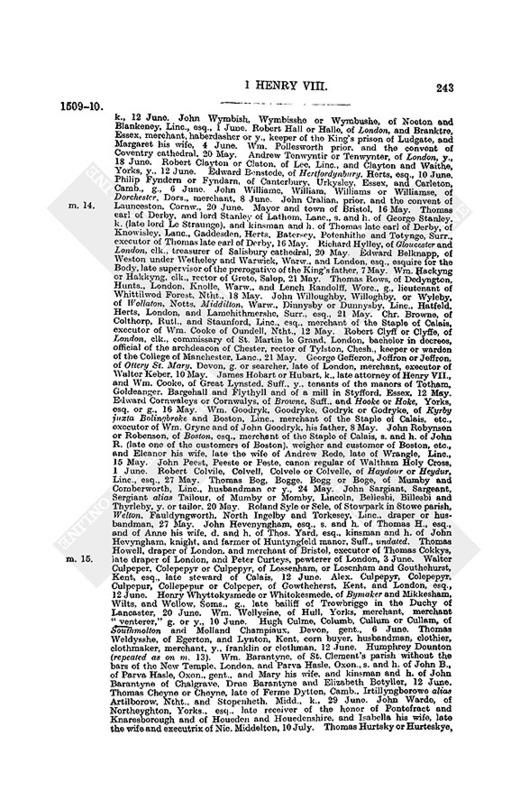 Lancelot Heedlee, Heedleegh, Heelee, Hedlee, Hedlere or Hedleghe, of Ovyngham, Owyngham, Naffurton, Naferton, Beaumysshe and Newcastle, Nthld., y., husband, g. or labourer, 15 June. John Norwode or Norwod, of Lekehampton or Lechehampton, Glouc., esq., s. and h. of John N. and Elizabeth his wife, one of the daughters of Miles Etton, s. of John Etton, knight, 12 June. Wm. Bulcombe, Bulcumbe or Bulcome, of Oxford, Abendon, Berks, London, and Briggewater, Soms., gent. or esq., 27 June. Leonard Thekker, Thykker or Thakker, of Bishops Lynn, Norf. and Boston, Linc., pewterer or yeoman, 20 June. Henry Olyver alias Skoser, of Horsyngton, Soms., y. or husbandman, 8 July. Thomas Fosse or Fos, of Bristol, Glauston or Glaston, Soms., gent., yeoman or singer, 20 June. Roger Neuburgh, knight, John FitzJames, junr., gent., John Horsey, esq., Thomas Lyte, esq., Wm. Strode, esq., Thomas Golde, John Michell and Thomas Sawyse, feoffees of Wm. Speke, late of Crukerne, Soms., gent., 20 June. Henry Edyall, clk., provost of Wyngham, Kent, archd. of Rochester, master of Arundel College, Suss., executor of Cardinal Morton, and rector of Estderham, Norf., 5 July. Mayor, bailiffs and commonalty of Exeter, 6 July. John Kyrkeham, of Blaccadon and Paynton, Devon, k., 16 May. Ralph Maunger, Manger, or Maungere, of Kellyngton, Cornw., tinner, husbandman or yeoman, 12 Nov. James Baskervyle or Baskerville, of Erdyley or Yerdesley in the marches of Wales, Remmesbury, Wilts, and Sugwas, Hertf. (sic), esq., s. and h. of Walter B., knight, and kinsman and h. of James B., knight, 10 Nov. Robert Gylby, of Donyngto, Gayton Graunge, Welton in the Marsh, Welles, and Assheby next Parteney, Linc., gent., and Margaret his wife, late the wife of John Muschampe, gent., dec., 9 Nov. Gilbert Stoughton, of Stoughton, Surr., and Ricote and Northweston, Oxon., gent., s. and h. of Thomas, executor of Ralph Staunton, dec., 12 Nov. Wm. Kelme or Kelom, of Estgrenwich and Erith, Kent, g., alias Wm. Draper, late of London, gent., and Isabel his wife, late wife of Robert Ballard, esq., 24 Oct. Elizabeth Hertford, Harford, or Herforth, of Huntingdon, widow and executrix of Gilbert Fisher, of Boston, Linc., merchant of the Staple of Calais, and of Leonard Cuny, of Boston, gent., daughter of Gervaise Clyfton of Tommby, Linc., esq., 4 Nov. James Boure, Bowre or Bower, clerk, rector of Hedley, Hants, vicar of Pydel, Dors., rector of Abbattissanne, and vicar of St. Bartholomew near Bridam, Hants, late of Newport in the Isle of Wight, of Oxford, and of Soca next Winchester, clerk, and rector of Titlescomb, Suss., 29 Oct. Edmond Kempe, of Ryngsted, Norf., Boughforth in Pykkyng parish, Yorks., London, and Roston, Norf., clerk, late of Cambridge University and vicar of Olkeham, Norf., 8 Nov. Isabel Braynton, abbess, and the convent of Godstow, Oxon., 7 Nov. John Edmund or Edmunde, clk., S.T.P., rector of Petworth, Suss., prb. of Wodhous in Chichester cathedral, rector of Suthflete, Kent, late one of the executors of Thos. Banke, clk., and of Robert Eliot, clk., 3 Oct. John Benette or Bennette, of Lyddelowe and Dudeley, Salop, weaver or yeoman, 12 Nov. Richard Sacheverell or Sawcheverell, of Kerby, Huncote and Assheby de la Zouche, Leic., Hopwell, Derb., and London, esq., 10 May. Wm. Reynold or Reynoldes, of Braunston next Leicester, and St. Clement's Danes, Midd., g., 9 May. Wm. Sharp or Sharpe, of Islyngton or Isylton, Midd., y. or innholder, 20 May. Wm. Romesey, Rumsey, Romesey or Rymesey, of Bykton, Mershewode, Fordyngbridges and Toichebury, Hants, gent., 16 May. Wm. Smith, bp. of Lincoln, alias bp. of Co. and Lich., bp. of Chester, or Henry VII. 's keeper of the Hanaper, 10 May. Henry Copleston or Copston, esq., of Bukyngton, Bykynton, and Exeter, Devon, esq., keeper of the gaol of Exeter, 20 May. Robert Cuny, of Westoncuny or Westocuny Uncarmond, Staff., Bognell, Derb., Ge, Salop, and Nedercot, Warw., g., 21 May. Ralph Rolston or Rolleston, of Lee, Leigh or Leygh in Asshover or Asshore parish, and Hatfeld, Dorb., and Haitfeilde, Yorks., g. or y., 20 May. Thomas Wortley or Worteley, of Wortley and Hymmesworth, Yorks, London and Westminster, k., 8 May. Wm. Stokdale, abbot of Kirkstall, 8 May. Robert Constable, of Flamborough, Holme in Spaldyngmore, Newbald, Huthome and Hothume, Yorks, and Somerby, Linc., k., 16 May. George Congherst or Congeherst, of Haukeherst, Kent, Hakeney, Midd., and Clement's Inn, g., an attorney in the Common Pleas, and Margaret his wife, who was the wife of Nicholas Chedworth, late of Stepenhith, Midd., esq., 16 May. John Staunesby or Stonesby, of Bylston, Suff., clothman or clothmaker, 16 May. Chr. Twynyho or Twynyowe, of Salisbury, clk., archdeacon of Berkshire, provost of St. Edmond's Salisbury, rector of Donet Mary and Gyllyngham, Dors., 8 May. Robert Gilbert or Gilberd, of Wytcombe, Dors., and Est Cammell and Wytcombe in the parish of Corton Dynham, Soms., esq., s. and h. of John and Joan Gilbert, 8 May. George Holford, of Holforth or Holford, Chesh., Westminster, Knowesley, Kent (sic), and London, k., 14 May. Simon Stalworth, clk., subdcan of Lincoln, prb. of St. Stephen's, Westminster, late of Bukden, Hunts., clk., and late clerk of the Hanaper, 8 May. John Smyth. late of Fresyngfeld, Suff., clk., 16 May. Edward Berd or Berde, of Sheremanbury, Suss., husbandman or yeoman, 16 May. Wm. Turvile or Turvill, of Newhall, Leic., and London, esq., 12 May. Alice Crayford, Craford or Crafford, of Newhall, Dovers in Hornchirch parish, "Parkars and Spycepyttes," and Nastoke, Essex, and London, widow of Thomas Crafford, esq., 12 May. John Porter, of Aston, Derb., y., 10 May. Philip Baynard or Banard, of Lakham or Lacham, Wilts, and London, esq., 16 May. Robert Gryce, of Wakefeld, Yorks., gent., s. and h. of Thomas, 16 May. John Barkett or Barket, of Chedesley or Chaddesley Corbet, Worc., y., bailiff and parkkeeper, 16 May. Wm. Wyllyngton, Welenton or Wolynton, of Barkeston, Warw., Todnam or Todenham, Glouc., and Calais, merchant of the Staple or woolman, 10 May. Wm. Wigan or Wigen, of Goodester, Essex, surgeon, alias of Bukyngham, Bucks, butcher or y., 12 May. Ralph Belle, Bylly or Beverley, of Kingston upon Hull, y., 28 April. Hugh Webbe, of Lichfield, Staff., barker or labourer, (s. and h. of Edward Webbe, of Homerwiche, Staff., husbandman), apprentice of Joan Middelton, late of Lichfield, widow, 10 May. John Clerk, of Quarryngdon, Bucks, and Waterlambyth or Lambythmarche, Surr., g., 8 May. John London, of Southcave, Yorks, g., 3 May. Edward Bland, of Sedberre or Sedberght, Yorks, y., 24 May. Thomas Beates or Bettys, of Aylesham, Norf., y., singleman, "rafman," mariner, grocer, merchant and burgess of Great Yarmouth, s. of Robert B., late of Aylysham, 19 May. Henry Plumsted or Plumpsted, of Barowe, Norf., y., mariner, bailiff and burgess of Great Yarmouth, s. of Robert P., late of Barowe, yeoman, 1 June. John Redmayn, of Stokwith, Notts, Loughborough, Leic., Cockermouth, Cumb., Ireby in Landesdale, Lanc., and Harwoode, Yorks., gent., 6 June. Thomas Besteney or Bestney, of Soham and Frodham, Camb., and Hycham and Bylston, Suff., y., 4 May. John Rooden, of Windsor, esq., serjeant at arms, keeper of Windsor great park, s. of Hugh Rooden, of Holt in Bromfeld, in Wales, g., 6 May. Thomas Glaisedale, of London and Westminster, pointmaker, y., leathermaker or pinner, 5 May. Thomas Goldstone. prior, and the convent of Christchurch, Canterbury, keepers of the spirituality of the abpric. in the late voidance, 1 May. Simon Fitz or Vice, of Barton in le Cley, Beds., and London, g., 7 May. John Westbury or Westbery, of Little Chalfeld and Heytysbury, Wilts, Farley, Soms., and Ryngwod, Hants, g., 8 May. Edmund Bury, Bery or Berrey, of Brightwell, Oxon., Wenryche, Glouc., and the Inner Temple, g., 5 May. Wm. Brekynshawe or Brekenshaw, of Aston Clynton, Bucks, y. or husbandman, 6 May. Wm. Gilberd, Gilbert or Ghilberd, prior, and the convent of Bruton, Soms., 1 May. John Seyntquyntyn or Seyntquynetn, of Herpham, Yorks., esq., executor of Edward Thwaytis who was late executor of Henry late earl of Northumberland, 4 May. Michael Inglysshe or Englysshe, late sheriff and mayor of London, mercer, merchant of the Staple of Calais, executor of Nic. Alwyn, late of London, mercer, and merchant of the Staple, and of Thomas Wode, late alderman of London, goldsmith (Alwyn also having been executor of Henry Cantelowe and Joan his wife), 9 May. Richard Cholmeley, Cholmley, Cholmodley or Cholmondeley, k., late deputy lieutenant of the Tower, 6 May. Charles Brandon, of London, and Bishop's Lynn, Norf., esq., 8 May. 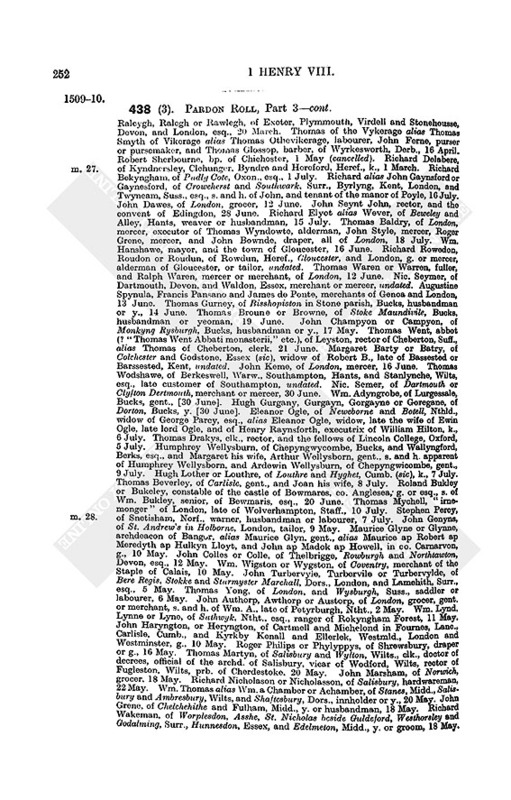 Lancelot Lisle or Lile, of Dorking, Surr., and Westminster, g., 9 May. Chr. Warde, of Gyvendale and Grysley, Yorks, knight, 3 May. Nic. Brome or Broune, of Badisley, Woodelowis and Warwick, Warw., esq., 8 May. Oliver Turnour or Turnoirr, g., vintner of London, late of the Household of Henry VII., 7 May. Hugh Loterell, Lotrell, Lutrell, Luterell, Luttrell, Lutterell or Lotterell, k., of Dunster, Mynheed, Cantok and Quantokkyshed, Soms., 12 May. Thomas Spencer or Spenser, of Honedell and Shirfford. Warw., and Flechehamsted, in com._(blank), g., s. and h. of John, 9 May. Randolf Sampford, of Thorpyssalwen, Yorks, Whitewell, Derb., and Caster and Castersoke, Linc., g., executor of Hugh Revell, 1 May. Katharine Langley or Langeley, widow and executrix of Henry Langley, and executrix of Wm. Chubbis, clk., 4 May. John Lincoln or Lyncoln, of London, pouch-maker, merchant, grocer, or broker, 11 May. Robert Barton, abbot, and the convent of Barlings, 12 May. Gruffith ap Jevan, of Kylken in North Wales and Westminster, late yeoman of the Crown, 14 May. Wm. Pysford or Pisforth, of Coventry, grocer, 10 May. Robert Saunders or Saunderres, of Stonton, Warw., Eston. Ewerdown and Northampton, Ntht., and London, g. or y., 14 May. John Horsey, Horsy or Horse, of Clofton Mabanke, or Clyfton Mabang, Dors., and London, esq., 14 May. Maurice Flood or LL'd, of London, alias Maurice Walshman, late of Elsyng, Norf., alias Maurice Apowell, late of _ (blank) co. Oxon., yeoman, 12 May. Robert Ventrys, Ventres or Venters, of Norwich and Loddon, Norf., fishmonger, 14 May. Ralph Verney or Veyney, of London and Henry VII. 's household, k., 15 May. Thomas Trenchard, of Walveton, or Wolveton, Dors., and London, k., occupier of a moiety of Childeckeford manor, Dors., 5 May. John Burward or Burghward, alias Buttler, of Elsyng and Massyngham Parva, Norf., yeoman, 12 May. Wm. Lane, of Ordelyngbere, Orlibere and Waldegrue, Ntht., Churchlaweford, Warw., and London, g., merchant of the Staple of Calais, executor of John Mervyn, late of Churchelawford, 10 May. Henry Brugge or Brugges, of Newbery, Berks, Fallesdon, Ludgarshale and Salisbury, Wilts, Poole, Dors., and London, esq. or merchant. 15 May. George Beamont Bevamount, Beamond, or Bewmonte, of Colby, Linc., and London, g., 12 May. Richard Hatton, clk., provost, and the scholars of the Royal College of St. Mary and St. Nicholas of Cambridge, 16 May. Richard Andrewe, of Charvelton, Ntht., citizen of London, merchant of the Staple of Calais, 17 May. Richard Cam or Came, of Worcester and Bedwardyn, Worc., Gloucester, Reading, Ledbury, Heref., and Northampton, mercer, weaver, clothmaker or yeoman, 5 May. John Conyers, of Hutton, Yorks, esq., s. and h. of Robert and Margaret Conyers, 18 May. Wm. Sayvage or Savage, of Milnthorpe next Wakefield, Sandall, Cawode and Maxfelde, Yorks, Leke, Staff., Tiddeswell, Derb., London and Lancaster, esq., steward of Wakefield, 7 May. Edward Saunders or Sawnders, of Harryngton and Welford, Ntht., gent., John Wattis, of Welford, Ntht., and London, administrator of the goods of Agnes Wattys, late of London, widow, and Maurice Osbern or Osborn, of Kelmershe, Ntht., gent., 18 May. Thomas Leeke, Leek or Leke, of Chesterfeld, Sutton in le Dale, and Halsland, Derb., and Landford, Notts, esq., executor of Marg. Leeke, widow, 18 May. Edmond Lucy, of Stratton in Bykylswad parish, Beds., Gayns in Stowghton Magna parish, Hunts., and London, k., and Eleanor his wife, d. and h. of Walter Trumpynton, knight, and late the wife of Richard Enderby, late of Stratton, k., 8 May. John Stokker or Stocker, of New Lymyngton, Hants, mercer or merchant, 20 May. Ranulph Maynwaryng or Mayngwaryng, of Carmygam, Chesh., and Magna Overa, Derb., esq., 20 May. Hugh Lancaster or Lancastre, of Winchester and Wutton, Hants, chapman or mercer, 15 May. Wm. Stourton, knight, lord Stourton, tenant of the manor of Estaynes ad Montem, Essex, and a carucate of arable land in Maydenton, Wilts, s. and h. of John late lord S. and Margaret his wife, late wife of John Cheyne, knight, also brother and h. of John late lord S. and kinsman and h. of Francis Stourton, 16 May. Wm. Senagh, Synaugh or Senowe, of Webley, Heref., chapman, clothman or yeoman, 16 May. Nic. Vaus, Vause, or Vaux, of Harwedon Magna, Ntht., and London, k., late hunt or lieutenant of Rokyngham Forest, lieutenant of Guisnes, and Anne his wife, one of the ds. and hs. of Thomas Grene, k., 19 May. John Cheyny, Cheyne, or Cheyney. of London, Sydyngbourn, Myddelton next Sydyngbourn. and the Isle of Shepey, Kent, g., 10 May. John Fetiplace, of Charney, North Dencheworth and Pusey, Berks, esq., s. and h. of Peter F., 15 May. John Eggecomb, of Oxford, g., one of the verderers of the forests of Shotover and Stowode, 8 May. Thomas Bowne or Bowen alias Lynakyer, alias Medyelton, of Honnyngton, Devon, yeoman or gent., 14 May. Wm. and Robert Morcot and John Ferneham, of Cleycoton, Ntht., husbandmen, 14 May. Thomas Raynold alias Gyllam, prior, and the convent of Lenton, 4 June. John Croke, of Caramton or Carhampton, Soms., butcher, yeoman or labourer, s. of George C., late of Wythycombe, Soms., husbandman, 7 June. Silvester de Giglis, bp. of Worcester, 8 May. Wm. 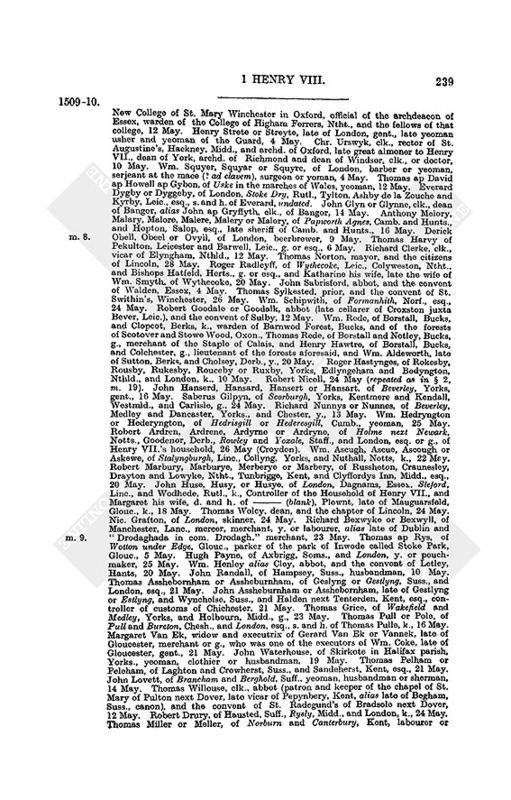 Assheby, of Lowesby and Groby, Leic., and Asteley, Warw., esq., s. and h. and executor of Wm. A., and one of the executors of Thomas Pulteney, k., and Wm. Smyth, g., dec., 28 May. James Oldefeld or Oldfeld, of Meltam, Yorks., Brynton, Bryenton. and Longbukby, Ntht., yeoman, yeoman of the Crown, 4 June. Chr. Ughtred, Owghtred, Owettred, Oweghtred or Utred, of Buttercrame, Kylwyke and Owestroppe, Yorks, esq., 3 May. Leonard Fell or Felle, of Osmonderley in Fourneys and Penyngton Halle in Fourneys, Lanc., yeoman or merchant, 8 May. Henry Hymerford or Hemerford, of Coker next Yevell, Soms., and London, gent., 1 May. Marmaduke Constable, of Flamborough and Holme in Spaldyngmore, Yorks, Tutbury, Staff., Somerby, Linc., and Berwick, k., 8 May. Wm. Peynter or Peyntore, of Cambridge, B.A., B.C.L., or brewer, 8 May. Thomas Thurresby, Thoresby or Thuresby, of Bishop's Lynne and Myntelyng, Norf., merchant or gent., 5 May. John Stepeneth or Stepneth, of Wallingford and Bradfeld, Berks., and Barnard's Inn in Holborn, g., bailiff and hundreder of St. Albans, Herts, of the liberty of the abbot, 12 May. Peter Marklond, of Prescote, Lanc., and Paglesham, Essex, husbandman, labourer or yeoman, 12 May. Richard Porter, brygandynemaker, and Wm. Duthek, sherman, of Shrewsbury, 8 May. Hugh Webbe, Webe or Webee, of Homerwyche, Edyall and Pype, Staff., y., 10 May. John Ludbroke, Lodbroke or Lodebroke, of Kenelworth or Kyllyngworth, Warw., and London, g., 10 May. Robert Shepard or Shopard, late of Aston juxta Stone, Pype, Castylhay, Hursche in the pa. of Bromley Abbot's, and Leke, Staff., y., 10 May. John Myddelton or Mydelton, of Egham, Surr. and London, g., or woodmonger, 11 May. Thomas Chycheley, of London, merchant tailor, 11 May. Thomas Lynde or Lyne, of Dunstaple, Beds., yeoman of the Crown or gent., executor of Thomas Gylmyn, late of St. Neot's, Hunts, g., dec., 4 May. John Seynt John, of Bletneso and Keysoo, Beds., Pallespury, Ntht., and Asshemere, Dors., k., 4 May. John Pennyngton, of Fournesse and Fountance, Yorks., yeoman, 11 May. Leonard Cuppuldyke, Copledyke, Copuldyke or Copuldyche, of Parham, Suff., and Horncastle, Linc., g., 5 May. John Fannar, of Terlyng and Little Badowe, Essex, and London, y. or husbandman, undated. Wm. Gascoign or Gascoyng, of Gawethrop or Gaukthrop, Yorks., k., 19 May. Wm. Clerk or Clerke, of Lambeth, Surr. and Cambridge, yeoman, groom, late servant of Thomas Wellys, clerk, and of the household of Wm. abp. of Canterbury, 6 June (in margin "pauper"). Nic. Yong, of Salisbury, tanner, "cordynar," "tavernar," or yeoman, 1 June. Lambert Langtre, of Esthaddon, Bukby, and Westhaddon, Ntht., esq., 28 May. Thomas Deynys or Deynes, of Gretplompsted, Norf., y., s. of John D. and executor of Wm. Fennowys and Robert Smyth, late of Wroxham, Norf., y., alias Thomas Deynys, of Great Yarmouth, beerbrewer, merchant or burgess, 30 May. Simon Olderyng or Oldryng, of Hensted, Suff., Norwich and Great Yarmouth, Norf., y. (s. of Robert Oldryng, of Hensted, y. ), butcher and burgess of Great Yarmouth, 26 May. Wm. Sharp, 20 May (repeated as on m. 3). Richard, the abbot, and the convent of Hagnaby, Linc., 23 May. Wm. Goche or Gouche, of London, Brome, Norf., and Clifford's Inn, g. or yeoman, 21 May. Adrian Fortescue, Foscu, Forscu, or Fortesku, of Stonor, Oxon., London and St. Clement's Danes, Midd., k., and Anne his wife, sister and h. of John, s. and h. of Wm. Stonor, k., and kinswoman and one of the heirs of (1) George s. and h. of John Nevyll, knight, marquis Mountagu, and Elizabeth his wife, (2) Edmond Inhaldesthorp, k., and Joan his wife, and (3) John late earl of Worcester, 23 May. Grace Yllyngworth, of Stonford, or Stanford, Notts, widow and executrix of Richard Yllyngworth, gent., alias Grace Sacheverell, gentlewoman, and Anne Slurry, of Uffyngton, Linc., widow and executrix of Richard Slurry or Slury, gent., s. and h. of Wm. Slurry, undated. Wm. Butler or Buttlar, grocer and alderman of London, and Elizabeth his wife, late the wife of John Saunder, draper of London, and merchant of the Staple of Calais, undated. John Peche or Pecche, of London, the King's Household, and Lullyngeston, Kent., k., undated. John Heron, of the Household, and Shukelwell in Hackney parish, Midd., esq., treasurer of the Chamber, grocer of London, or gent., John Daunce, one of the tellers of the Exchequer, late of Thame, Oxon., goldsmith of London or gent., and Ralph Pexsall, one of the Six Clerks of Chancery, g., undated. Thomas Bolayn, of Blikling, Norf., Hever, Kent, New Inn without Temple Bar, and Hoo, Beds., esq., s. and h. of Wm. B., k., 4 May. Robert Wodward or Wodwarde, of Buckingham, yeoman, s. and h. and executor of Wm. W., and executor of Henry Collyer, of Hogshawe, Bucks, 12 May. Richard Coffyn, of Portlynche and Were, Devon, and London, esq., 12 May. Wm. Puntyngton, Poynetyngton or Poyntyngton, of Ilmister, Soms., and Bagshot, Berks, y., 12 May. John bp. of Carlisle, alias John late abbot of Leicester, executor of Robert Motton, esq., John Penny, of Leicester, and John Babyngton, knight, undated. Thomas Tretherf, of Tretref, Cornw., s. and h. of John, and Mary his wife (d. and h. of John Trevysa or Trevysall and kinswoman and h. of Henry Trevysa) and Amicia Trevisa, widow and executrix of the said John Trevysa, 23 May. Wm. Cruys, Crues or Cruse, of Chulmelegh, Chymle, Chymley, Tuverton, Colombe John, Ottery St. Mary and Cruys Morchard, Devon, g., 25 May. Richard Willys or Willeys, clk., late fellow of the New College of St. Mary Winchester in Oxford, official of the archdeacon of Essex, warden of the College of Higham Ferrers, Ntht., and the fellows of that college, 12 May. Henry Strete or Streyte, late of London, gent., late yeoman usher and yeoman of the Guard, 4 May. Chr. Urswyk, clk., rector of St. Augustine's, Hackney, Midd., and archd. of Oxford, late great almoner to Henry VII., dean of York, archd. of Richmond and dean of Windsor, clk., or doctor, 10 May. Wm. Squyer, Squyar or Squyre, of London, barber or yeoman, serjeant at the mace (? ad clavem), surgeon or yoman, 4 May. Thomas ap David ap Howell ap Gybon, of Uske in the marches of Wales, yeoman, 12 May. Everard Dygby or Dyggeby, of London, Stoke Dry, Rutl., Tylton, Ashby de la Zouche and Kyrby, Leic., esq., s. and h. of Everard, undated. John Glyn or Glynne, clk., dean of Bangor, alias John ap Gryffyth, clk., of Bangor, 14 May. Anthony Melory, Malary, Malore, Malere, Malery or Malory, of Papworth Agnes, Camb. and Hunts., and Hopton, Salop, esq., late sheriff of Camb. and Hunts., 16 May. Derick Obell, Obeel or Ovyll, of London, beerbrewer, 9 May. Thomas Harvy of Pekulton, Leicester and Barwell, Leic., g. or esq., 6 May. Richard Clerke, clk., vicar of Elyngham, Nthld., 12 May. Thomas Norton, mayor, and the citizens of Lincoln, 28 May. Roger Radlcyff, of Wythecoke, Leic., Colyweston, Ntht., and Bishops Hatfeld, Herts., g. or esq., and Katharine his wife, late the wife of Wm. Smyth, of Wythecoke, 20 May. John Sabrisford, abbot, and the convent of Walden, Essex, 4 May. Thomas Sylkested, prior, and the convent of St. Swithin's, Winchester, 26 May. Wm. Schipwith, of Formanhith, Norf., esq., 24 May. Robert Goodale or Goodalk, abbot (late cellarer of Croxston juxta Bever, Leic. ), and the convent of Sulby, 12 May. Wm. 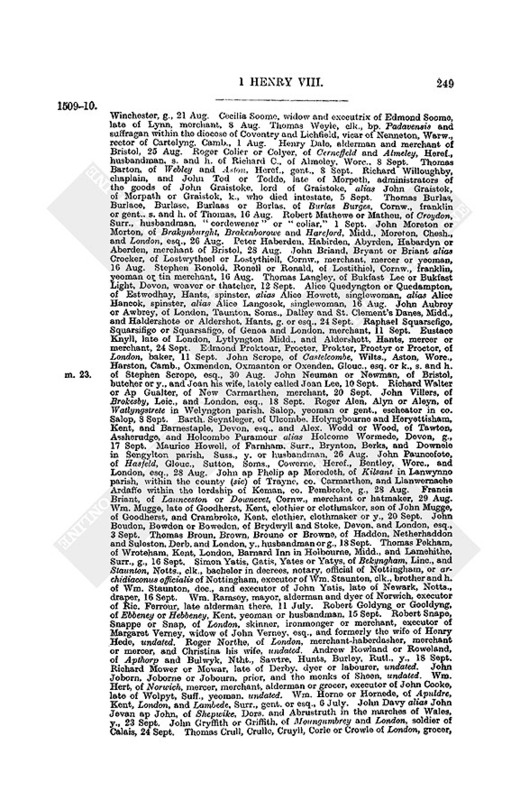 Rede, of Borstall, Bucks, and Clopcot, Berks, k., warden of Barnwod Forest, Bucks, and of the forests of Scotover and Stowe Wood, Oxon., Thomas Rede, of Borstall and Notley, Bucks, g., merchant of the Staple of Calais, and Henry Hawtre, of Borstall, Bucks, and Colchester, g., lieutenant of the forests aforesaid, and Wm. Aldeworth, late of Sutton, Berks, and Cholsey, Derb., y., 20 May. Roger Hastynges, of Rokesby, Rousby, Rukesby, Rouceby or Ruxby, Yorks, Edlyngeham and Bodyngton, Nthld., and London, k., 10 May. Robert Nicoll, 24 May (repeated as in § 2, m. 19). John Hanserd, Hansard, Hansert or Hansart, of Beverley, Yorks, gent., 16 May. Saberus Gilpyn, of Scorburgh, Yorks, Kentmere and Kendall, Westmld., and Carlisle, g., 24 May. Richard Nunnys or Nunnes, of Beverley, Medley and Dancaster, Yorks., and Chester, y., 13 May. Wm. Hedryngton or Hederyngton, of Hedrisgill or Hederesgill, Cumb., yeoman, 25 May. Robert Ardren, Ardrene, Ardyrne or Ardryne, of Holme next Newark, Notts., Goodenor, Derb., Rowley and Yoxale, Staff., and London, esq. or g., of Henry VII. 's household, 26 May (Croydon). Wm. Ascugh, Ascue, Ascough or Askewe, of Stalyngburgh, Linc., Collyng, Yorks, and Nuthall, Notts, k., 22 May. Robert Marbury, Marburye, Merberye or Marbery, of Russheton, Craunesley, Drayton and Lowyke, Ntht., Tunbrigge, Kent, and Clyffordys Inn, Midd., esq., 20 May. John Huse, Husy, or Husye. of London, Dagnams, Essex. Sleford, Linc., and Wodhede, Rutl., k., Controller of the Household of Henry VII., and Margaret his wife, d. and h. of _ (blank), Plownt, late of Mauguarsfeld, Glouc., k., 18 May. Thomas Wolcy, dean, and the chapter of Lincoln, 24 May. Nic. Grafton, of London, skinner, 24 May. Richard Bexwyke or Bexwyll, of Manchester, Lanc., mercer, merchant, y. or labourer, alias late of Dublin and "Drodaghada in com. Drodagh," merchant, 23 May. Thomas ap Rys, of Wotton under Edge, Glouc., parker of the park of Inwode called Stoke Park, Glouc., 5 May. Hugh Payne, of Axbrigg, Soms., and London, y. or pouchmaker, 25 May. Wm. Henley alias Cley, abbot, and the convent of Letley, Hants, 20 May. John Randall, of Hampsey, Suss., husbandman, 10 May. Thomas Asshebornham or Assheburnham, of Geslyng or Gestlyng, Suss., and London, esq., 21 May. John Assheburnham or Asshebornham, late of Gestlyng or Estlyng, and Wynchelse, Suss., and Halden next Tenterden, Kent, esq., controller of customs of Chichester, 21 May. Thomas Grice, of Wakefield and Medley, Yorks, and Holbourn, Midd., g., 23 May. Thomas Pull or Pole, of Pull and Bureton, Chesh., and London, esq., s. and h. of Thomas Pulle, k., 16 May. Margaret Van Ek, widow and executrix of Gerard Van Ek or Vannek, late of Gloucester, merchant or g., who was one of the executors of Wm. Coke, late of Gloucester, gent., 21 May. John Waterhouse, of Skirkote in Halifax parish, Yorks., yeoman, clothier or husbandman, 19 May. Thomas Pelham or Peleham, of Laghton and Crowherst, Suss., and Sandeherst, Kent, esq., 21 May. John Lovett, of Brancham and Berghold, Suff., yeoman, husbandman or sherman, 14 May. Thomas Willouse, clk., abbot (patron and keeper of the chapel of St. Mary of Pulton next Dover, late vicar of Pepynbery, Kent, alias late of Begham, Suss., canon), and the convent of St. Radegund's of Bradsole next Dover, 12 May. Robert Drury, of Hausted, Suff., Rysly, Midd., and London, k., 24 May. Thomas Miller or Meller, of Norburn and Canterbury, Kent, labourer or husbandman, 12 May. Thomas Spryng, of Lavenham or Laneham, Suff., and London, merchant, clothmaker, clothier, g., esq. or y., 24 May. John Courthop, Courthoppe, or Courthope, of Goutherst, Kent, and London, g., an attorney of the Common Bench, s. and h. of Henry Courthorpe, 10 May. Wm. Clopton, of Longmelford, Suff., and London, k. (s. and h. of John C., esq. ), and his wife, John Clopton, of Longmelford, esq., and Elizabeth his wife, and Thomas Barney, of Carewe, Norf., and Katharine his wife, kinswomen and heirs of Isabel Reynsford, late the wife of John Reynesford, esq., and d. and h. of Edward Knyvet esq. ; alias Wm. Clopton, knight, and Thomasia his wife, sister of the said Edward Knyvet, John Clopton, esq., and Elizabeth his wife and Thomas Barney, gent., and Katharine his wife, 24 May. John Huddilston, Hudelston, Hodelston, Hudleston, or Hurleston, of Studeley, Glouc., Millom, Cumb., Boynton and Goderston, Yorks., and London, k., 24 May. Wm. Freme, of Berkeley and Netherlupeyate, Glouc., g. or esq., 21 May. Walter Beche or Beache, of Gloucester, draper, hosier or wiredrawer, 22 May. 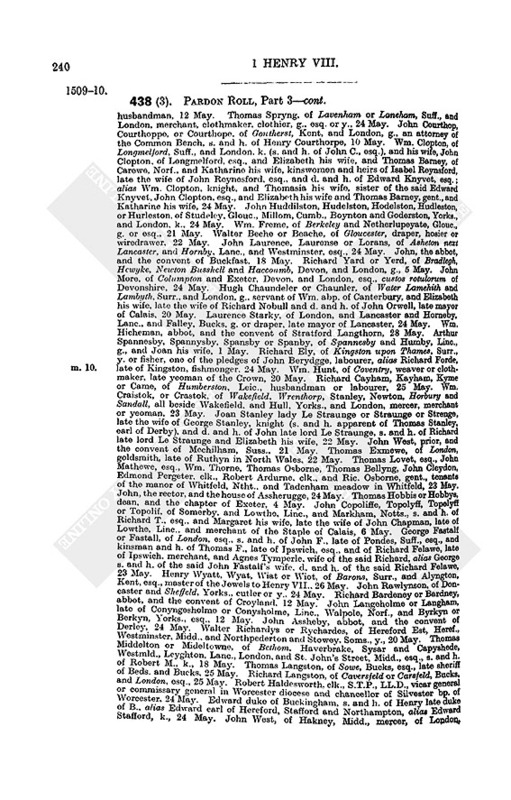 John Laurence, Laurense or Lorans, of Asheton next Lancaster, and Hornby, Lanc., and Westminster, esq., 24 May. John, the abbot and the convent of Buckfast, 18 May. Richard Yard or Yerd, of Bradlegh, Hewyke, Newton Busshell and Haccoumb, Devon, and London, g., 5 May. John More, of Columpton and Exeter, Devon, and London, esq., custos rotulorum of Devonshire, 24 May. Hugh Chaundeler or Chaunler, of Water Lamehith and Lambyth, Surr., and London, g., servant of Wm. abp. of Canterbury, and Elizabeth his wife, late the wife of Richard Nobull and d. and h. of John Orwell, late mayor of Calais, 20 May. Laurence Starky, of London, and Lancaster and Horneby, Lanc., and Falley, Bucks, g. or draper, late mayor of Lancaster, 24 May. Wm. Hicheman, abbot, and the convent of Stratford Langthorn, 28 May. Arthur Spannesby, Spannysby, Spansby or Spanby, of Spannesby and Humby, Linc., g., and Joan his wife, 1 May. Richard Ely, of Kingston upon Thames, Surr., y. or fisher, one of the pledges of John Berydgge, labourer, alias Richard Forde, late of Kingston, fishmonger. 24 May. Wm. Hunt, of Coventry, weaver or clothmaker, late yeoman of the Crown, 20 May. Richard Cayham, Kayham, Kyme or Came, of Humberston, Leic., husbandman or labourer, 25 May. Wm. Craistok, or Crastok, of Wakefield, Wrenthorp, Stanley, Newton, Horbury and Sandall, all beside Wakefield, and Hull, Yorks., and London, mercer, merchant or yeoman, 23 May. Joan Stanley lady Le Straunge or Straunge or Strenge, late the wife of George Stanley, knight (s. and h. apparent of Thomas Stanley, earl of Derby), and d. and h. of John late lord Le Straunge, s. and h. of Richard late lord Le Straunge and Elizabeth his wife, 22 May. John West, prior, and the convent of Mechilham, Suss., 21 May. Thomas Exmewe, of London, goldsmith, late of Ruthyn in North Wales. 22 May. Thomas Lovet, esq., John Mathewe, esq., Wm. Thorne, Thomas Osborne, Thomas Bellyng, John Cleydon, Edmond Pergeter, clk., Robert Ardurne, clk., and Ric. Osborne, gent., tenants of the manor of Whitfeld, Ntht., and Tadenham meadow in Whitfeld, 23 May. John, the rector, and the house of Assherugge, 24 May. Thomas Hobbis or Hobbys, dean, and the chapter of Exeter, 4 May. John Copoliffe, Topolyff, Topelyff or Topolif, of Somerby, and Lowthe, Linc., and Markham, Notts., s. and h. of Richard T., esq., and Margaret his wife, late the wife of John Chapman, late of Lowthe, Linc., and merchant of the Staple of Calais, 6 May. George Fastalf or Fastall, of London, esq., s. and h. of John F., late of Pondes, Suff., esq., and kinsman and h. of Thomas F., late of Ipswich, esq., and of Richard Felawe, late of Ipswich, merchant, and Agnes Tymperle, wife of the said Richard, alias George s. and h. of the said John Fastalf's wife, d. and h. of the said Richard Felawe, 23 May. Henry Wyatt, Wyat, Wiat or Wiot, of Barons, Surr., and Alyngton, Kent, esq., master of the Jewels to Henry VII., 26 May. John Rawlynson, of Doncaster and Sheffeld, Yorks., cutler or y., 24 May. Richard Bardeney or Bardney, abbot, and the convent of Croyland, 12 May. John Langeholme or Langham, late of Conyngesholme or Conysholme, Linc., Walpole, Norf., and Byrkyn or Berkyn, Yorks., esq., 12 May. John Assheby, abbot, and the convent of Derley, 24 May. Walter Richardys or Rychardes, of Hereford Est, Heref., Westminster, Midd., and Northpederton and Stowey, Soms., y., 202 May. Thomas Middelton or Mideltowne, of Bethom. Haverbrake, Sysar and Capyshede, Westmld., Leyghton, Lanc., London, and St. John's Street, Midd., esq., s. and h. of Robert M., k., 18 May. Thomas Langston, of Sowe, Bucks, esq., late sheriff of Beds. and Bucks, 25 May. Richard Langston, of Caversfeld or Carsfeld, Bucks, and London, esq., 25 May. Robert Haldesworth, clk., S.T.P., LL.D., vicar general or commissary general in Worcester diocese and chancellor of Silvester bp. of Worcester, 24 May. Edward duke of Buckingham, s. and h. of Henry late duke of B., alias Edward earl of Hereford, Stafford and Northampton, alias Edward Stafford, k., 24 May. John West, of Hakney, Midd., mercer, of London, 24 May. Wm. Broke, clk., custos et collegius, and the scholars of All Souls College, Oxford, 24 May (Croydon). Jasper Filoll, Fyloll or Philoll, of London, of Pole and Kyngeston Mawreward, Dors., Stepenhith, Midd., and Camerwell, Surr., and London, esq., and Joan his wife, late the wife of Nic. Ruynon and of Robert Grey, 24 May. Thomas Osbarne, Osburne or Osborne, clk., vicar of Dorking, Surr., 21 May. Edward Wadham, of Tormerton, Glouc., and Churchill, Soms., esq., and Isabella his wife, late the wife of John Seyntloo, k., 24 May. Roger Goold, Gold or Goldd, of Bedford, Northampton, and London, merchant of the Staple of Calais, 16 May. John London, of Southcave, Yorks, g., 3 May. Wm. Birdde, prior, and the convent of Bath, 20 May. Alex. Eveas or Evyas, of Bobbyng, Kent, g., tenant of the manor of Easthall and Elmele, Kent, 10 May. Wm. Brige, Bryge, Bryge, or Brigge, of Preston in Craven, Wekelsworth, Calvarey, and Ripon, Yorks., labourer, innholder or y., 24 May. David Wynchecombe, abbot, and the convent of Strata Marcella, 24 May. John Melton, of Aston, Yorks., Bramley, Staff., and Aissheton, Lanc., esq., and Margaret his wife. 20 May. Thomas Crempe, of Launceston and Henterdreme, Cornw., y., 20 May. Robert Morgan or Morgayne, of Cumberton or Comberton Parva, and Rowslenche, Worc., and Stodeley, Warw., and Anne his wife, late the wife of Th. Lestraunge, of co. Bucks. 23 May. Hugh Warham, Warram or Warraham, of Ocle, Hants, Magna Harwod, Bucks, Bochipiswod in Stepney parish, Midd., Micham, Surr., and Le Motte in Maidston parish, Kent, g., 28 May. Thomas Morys, Mores or Morrys, of London, grocer, merchant of the Staple of Calais, merchant adventurer of London, 24 May. Wm. Burwell, Borewell or Borwell, of London, skinner or merchant, 24 May. Wm. Corbett or Corbet, of Hunstanton, Hunstone, and Parva Massyngham, Norf., y., 24 May. Henry Asheton alias Ashill, of Hunstanton and Massyngham Parva, Norf., y., 24 May. David John, alias Walsheman, of Elsyng and Massynghame Parva, Norf., y., servant of Robert Straunge, esq., 24 May. John Isham, of Gilford or Goldeford, Surr., and Windsor, Berks, y., 24 May. Edward Sharnebroke, of London, clk., executor of Wm. Purchas, alderman of London, 21 May. Peter Sawle, or Saulle or Sale, of Henkkester, Westmld., husbandman, labourer or y., 26 May. John Islyp, abbot and the convent of Westminster, 24 May. Wm. Chaunterell, of Hale and Bath, Chesh., esq., 23 May. John Ireby, clk., vicar of Aspatre or Aspatrik. Cumb., 28 May. John Stork, of Nawferton, Nauffarton, Naffarton, Selby, and Hull, Yorks., and Boston and London, mercer, merchant of the Staple, or grocer, and Wm. Holbek, of York and Selby, Yorks., and London, esq., merchant of the Staple, or grocer, 12 May. 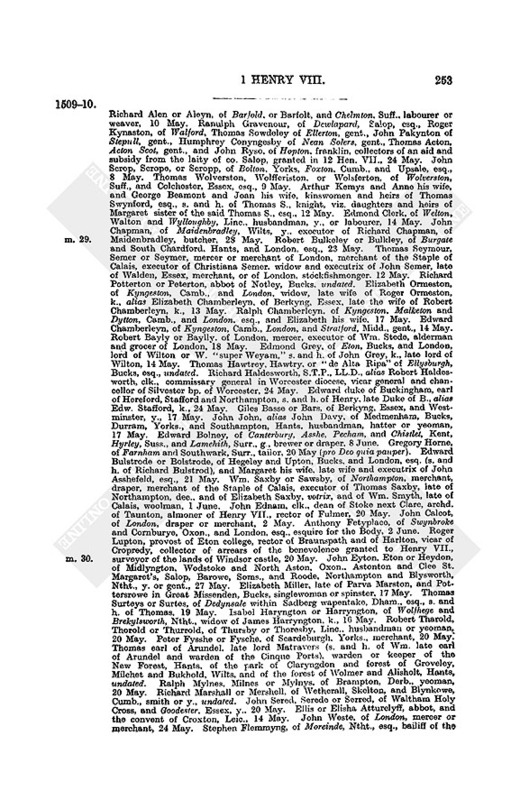 Miles Bussy, Bussche or Busche, of Howham or Agham, Linc., knight, s. and h. of Hugh B., k., 24 May. Wm. Gilbert, Gilbard or Gilberde, of Old Romney parish and Brokland, Kent, 24 May. Edmond Trafford or Traford, of Trafford, Lanc., k., and Margaret his wife, late the wife of John Hanford, 29 May. Richard Rawelyns, custos, and the scholars of Merton College, Oxford, 28 May. Richard FitzJames, bp. of London, late bp. of "Cirencestr." (i.e. Chichester) and Rochester, 28 May. Richard Chetham prior, and the convent of Ledes, Kent, 15 May. Robert Peyton, of London, Esthorp, Essex, of Wyken and Iselham, Camb., esq. or k., brother and h. of Thomas Peyton, esq., and kinsman and h. of Thomas Peyton of Iselham, Camb., esq., and of Chr. Peyton, esq., 22 May. John Davy or Davys alias John ap Deicons, of Cranebroke, Kent, mercer, chapman or tailor, 29 May. Richard Smyth, of Redyng, Berks, and London, g. or clothier, and Agnes his wife, late the wife of Henry Justice, 26 May. Thomas Snyge or Snyg, of London, Bristol, and Southwark, mercer or merchant, 26 May. Nic. Mattok, of London, and Hichyn, Herts, fishmonger or gent., 25 May (Croydon). Roger Dawis, Dawes, Dawx or Davys, of Bristol, merchant, 26 May (Croydon). John Williamson or Williams, of Bristol, brewer, 25 May (Croydon). Wm. Remyngton alias Webbe. alderman, fishmonger, or merchant, of London, 30 May (Croydon). Wm. Webbe, of Tavestoke and Exeter, Devon, merchant 30 May (Croydon). Richard Garlond or Garland, of Totnes, or Totnys and Whitfyld. Devon, g., 6 June. Edward Odyngsellis, or Odyngselles, or Odyngsellez, of Long Ichyngton or Long Igyngton, Warw., esq., 4 June. John Hevenyngham, of Keteryngham and Shelton, Norf., and London, esq., farmer of Huntingfeld, Suff., s. and h. of Thomas H. and Anne his wife (d. and h. of Thomas Yard, esq. ), kinsman and h. of John Hevenyngham, k., 23 May. Henry Higecok, Higgecokkes or Hechecok, of London, baker, 12 May. Thomas Walcot, Walcott or Walcote, of South Malling, Suss., husbandman, labourer or y., 25 May (in margin "pauper"). Wm. Radsole or Raddeshole, of Hougham or Howeham, Kent, husbandman, 5 May (in marg. "pauper"). Thomas Chelton or Chilton, of Hanslop or Hanselap, Bucks, pulter, 5 June (in marg. "pauper"). Robert Womersley or Womerseley, of Cotingham, Hull, Marflete upon Humber, Purston and Wyton in Holdernesse, Yorks., husbandman, "coorser," or "corser," or y., 3 June. John Bampton, of Hull and London, merchant, or vintner, poticary, merchant of the Staple of Calais, mercer of London, 4 June. Henry Hichecokkes, Hichecokkys or Hychecokes, of London, baker or "whitebaker," 12 May. John Jeraard, Jerard or Jeraarde, of Hyde in Purbek, Dors., gent., 1 June. Edward Muriell, Muryell, Moryell or Murell, of London and Ulstorp in Cleibroke parish, Worc. (sic), grocer, 1 June. Robert Watson, of London, tailor, 1 June. John Stone, of Salisbury, merchant, and Wm. 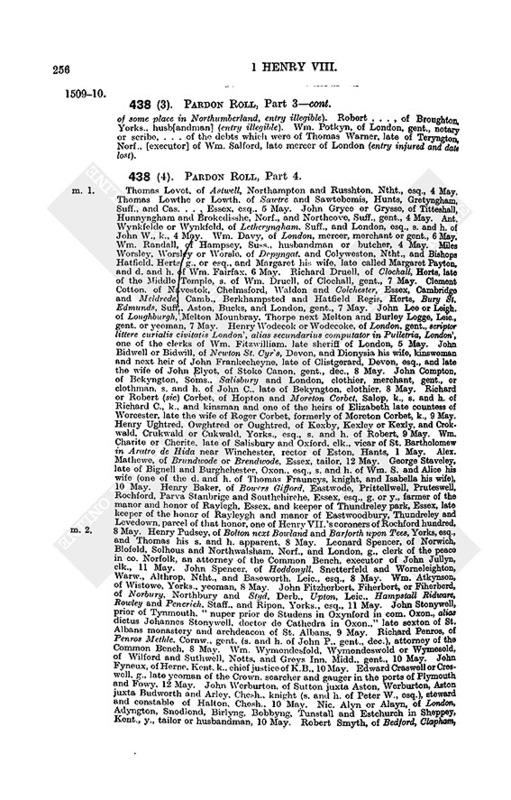 James, of Southampton and Salisbury, factors and attorneys of Wm. Webbe, Thomas Coke and Wm. Haukyns, of Salisbury, undated. James Missenden, of Helyng, or Heelyng, Magna Lymber and Ketilby next Brygge, Linc., gent., 22 May. John Grene or Greene, late of Coudale, Cowedale, Cowdale, Bakewell and Bakwell, Derb., husbandman, yeoman or labourer, 29 April. John Rede, warden, and the scholars of St. Mary College of Winchester, beside Winchester, 30 May. John Myddelton, Middelton, Medilton, Meelton or Medelton, of London, mercer, merchant or merchant adventurer, 7 June. Thomas Corbet, Corbete or Corbett, of Longdon, Salop, and Dudley, Staff., gent., s. and h. of Richard, 21 May. Wm. Muklowe, Mukelowe or Mockelowe, of Worcester, Coventry, and London and Halysowen, Salop, merchant, mercer or y., 2 June. Wm. Colle or Coll, of Gloucester, mercer, clothier or alderman, 27 May. Wm. Scargyll or Scargell, of Thorpestapulton next Ledes and Ledehall, Yorks., Greys Inn, Midd., and London, k., steward of the honors of Pontefract and Knaresborough, 12 May. John Abrehale or Abrall, of Eton Tregos and Ingston in Foye parish, Heref., esq., s. and h. of Wm., 6 June. James ap Ryce, of Langua and Grocemond in the marches of Wales, and Hereford, chaplain or clerk, 29 May. Wm. Bogays, Boggas or Bogas, late of Edwardstowne, Edwardyston, or Hedwardstowne, Suff., clothmaker or y., s. and h. of Wm. B., late of Edwardston, clothmaker, 4 June. Matthew Shelvyng, of Southampton, Hants, Shilham, Godmersham and Feversham, Kent, and London, y. or labourer, 4 June (in margin "pauper"). Wm. Oldefeld or Oldfeld, of Magna Bukbe and Northampton, Ntht., husbandman or y., undated. Cecilia Milaton, prioress, and the convent of Polslo, Devon, 25 May. Thomas Puntyngdon, Puntyngton or Puntyngeon, of Shodbroke, Pynnecote and Uptonhillyngis, Devon, g., 25 May. Meredith ap Jevan ap Robert, of Dolwethelan, co. Caernarvon, g., s. and h. of Jevan ap Robert ap Meredith, late of Pennevyd, co. Caern., g., and Gwenhoun verz Gruff ap Hoell, his wife, 4 June. John Fenymore or Fylmore, of Stokecanon, Devon, groom, 25 May. Humphrey Dounton, Downeton or Donton, of Beamond, Upyngham and Rylyngton, Rutld., Assheby de Lazouche, Leic., Newton Seyntlowe, Soms., and London, y., 28 May. Thomas Wylcockys, Wylcockes, Wylcokes or Wylcokkes, of Wendover, Lytull Bryckehyll, Chepyngewycombe, Lurgathall, Brehyll and Stokemaundesfell, Bucks and Sarat, Herts, and London, y., undated. John Colyns alias Welyngton, abbot of Athelney, 20 May. Henry Danyell, of Helgay, Ereston and Elgay, Norf., clk., 12 June. Thomas Hanyball or Honyball, clk., LL.D., of London, Cambridge and Cawewode, Yorks, commissary general in co. York, 3 June. Wm. Brodele, Brodlee, Brodeley, Brodley or Browley, of Halifax or Holefax and Beverley, Yorks, sherman, walker, fuller, clothmaker or y., 8 June. Thomas Butler or Botiller, of Stowe and Wygnall, Norf., labourer or y., 30 May. Edward Catesby, Catisby or Catesbe, of Goodeby, and Nawisley, Leic., and Benyfelde, Ntht., g., s. and h. of Eusebius C., late of Brygstoke, Ntht., gent., and administrator of the goods of Anne late the wife of the said Eusebius, 8 June. Wm. Gillet or Gilliet, of Appulby, Westmld., "cliens ad clavem burgi predicti, videlicet sergiaunt at the mase," 13 June. Reynold Aderton, Atherton or Adirton, of Langley Marres, Bucks, Ormeskirke, Bradley and Hornby, Lanc., Lyme, Chesh. and London, g., 14 June. John Underhyll, Undrell, Undirhyll or Underhull, of London, clk., master of the New College of St. Mary of Northzevell, Beds., rector of a moiety of Houghton Conquest and of St. Michael Archangel's at Queenhithe, London, 1 June. Wm. Morgan or Morgon, of Bedford, clk., LL.D., master of the hospital of St. John of Bedford, rector of St. John Baptist's in Bedford and of Pallespury, Ntht., commissary and official of the archdeacon of Bedford, 1 June. Robert Teryngton, of Eswell, Teryngton, Iklyngham, Ersewell and Ereswell, Suff., woolman, tailor or husbandman, 16 June. Master Thomas Brent, clk., LL.D., dean of the collegiate church of St. Michael Archangel of the immediate jurisdiction of Christchurch, Canterbury, prb. of Holbourne in St. Paul's Cathedral, one of the executors of Queen Elizabeth late consort of Edward IV., 12 June. John Spaffolde or Spaffald, of London, baker, late a groom of the bakehouse of Henry VII., 12 June. John Malverne alias Pope, canon and subprior of Cirencester, rector of the parish church there, 10 June. Robert, the prior, and the convent of Royston, Herts, 6 June. Thomas Pykeryng, Pekeryng, Pykyryng, Pykyrryng or Pekerryng, of London, esq., s. and h. of John P., of Oswaldkyrke, Yorks, k., 12 June. John Wymbish, Wymbisshe or Wymbushe, of Nocton and Blankeney, Linc., esq., 1 June. Robert Hall or Halle, of London, and Branktre, Essex, merchant, haberdasher or y., keeper of the King's prison of Ludgate, and Margaret his wife, 4 June. Wm. Pollesworth prior, and the convent of Coventry cathedral, 20 May. Andrew Tenwyntir or Tenwynter, of London, y., 18 June. Robert Clayton or Clayton, of Lee, Linc., and Clayton and Waithe, Yorks, y., 12 June. Edward Benstede, of Hertfordynbury, Herts, esq., 10 June. Philip Fyndern or Fyndarn, of Canterbury, Urkysley, Essex, and Carleton, Camb., g., 6 June. John Williame, William, Williams or Williamse, of Dorchester, Dors., merchant, 8 June. John Cralian, prior, and the convent of Launceston, Cornw., 20 June. Mayor and town of Bristol, 16 May. Thomas earl of Derby, and lord Stanley of Lathom, Lanc., s. and h. of George Stanley. k. (late lord Le Straunge), and kinsman and h. of Thomas late earl of Derby, of Knowisley, Lanc., Gaddesden, Herts, Batersey, Potenhithe and Totynge, Surr., executor of Thomas late earl of Derby, 16 May. Richard Hylley, of Gloucester and London, clk., treasurer of Salisbury cathedral, 20 May. Edward Belknapp, of Weston under Wetheley and Warwick, Warw., and London, esq., esquire for the Body, late supervisor of the prerogative of the King's father, 7 May. Wm. Hackyng or Hakkyng, clk., rector of Grete, Salop, 21 May. Thomas Rows, of Dedyngton, Hunts., London, Knolle, Warw., and Lench Randolff, Worc., g., lieutenant of Whittilwod Forest, Ntht., 18 May. John Willoughby, Willoghby, or Wyleby, of Wollaton, Notts, Middilton, Warw., Dinnysby or Dunnysby, Linc., Hatfeld, Herts, London, and Lamehithmershe, Surr., esq., 21 May. Chr. 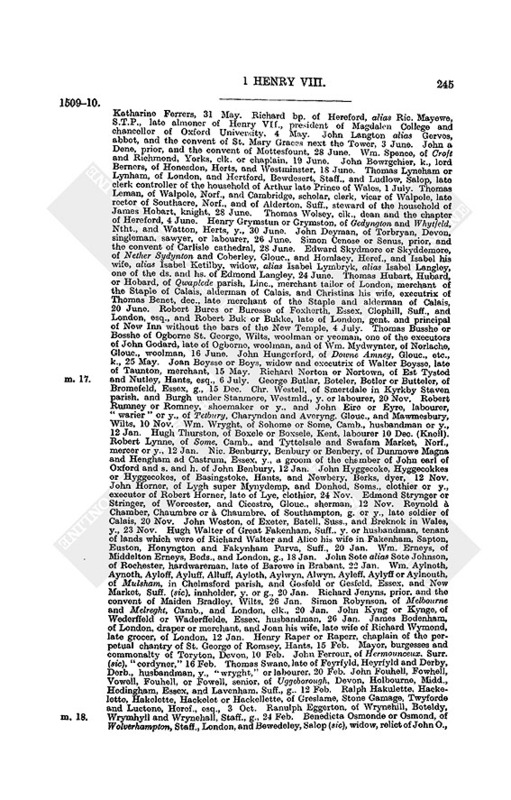 Browne, of Colthorp, Rutl., and Staunford, Linc., esq., merchant of the Staple of Calais, executor of Wm. Cooke of Oundell, Ntht., 12 May. Robert Clyff or Clyffe, of London, clk., commissary of St. Martin le Grand, London, bachelor in decrees, official of the archdeacon of Chester, rector of Tylston, Chesh., keeper or warden of the College of Manchester, Lanc., 21 May. George Gefferon, Joffron or Jeffron, of Ottery St. Mary, Devon, g. or searcher, late of London, merchant, executor of Walter Keber, 10 May. James Hobart or Hubart, k., late attorney of Henry VII., and Wm. Cooke, of Great Lynsted, Suff., y., tenants of the manors of Totham, Goldeanger, Bargehall and Flythyll and of a mill in Styfford, Essex, 12 May. Edward Cornwaleys or Cornwalys, of Browne, Suff., and Hooke or Hoke, Yorks, esq. or g., 16 May. Wm. Goodryk, Goodryke, Godryk or Godryke, of Kyrby juxta Bolingbroke and Boston, Linc., merchant of the Staple of Calais, etc., executor of Wm. Gryne and of John Goodryk, his father, 8 May. John Robynson or Robenson, of Boston, esq., merchant of the Staple of Calais, s. and h. of John R. (late one of the customers of Boston), weigher and customer of Boston, etc., and Eleanor his wife, late the wife of Andrew Rede, late of Wrangle, Linc., 15 May. John Peest, Peeste or Peste, canon regular of Waltham Holy Cross, 1 June. Robert Colvile, Colvell, Colvele or Colvelle, of Haydour or Heydur, Linc., esq., 27 May. Thomas Bog, Bogge. Bogg or Boge, of Mumby and Comberworth, Linc., husbandman or y., 24 May. John Sargiant, Sargeant, Sergiant alias Tailour, of Mumby or Momby, Lincoln, Bellesbi, Billesbi and Thyrleby, y. or tailor, 20 May. Roland Syle or Sele, of Stowpark in Stowe parish, Welton, Fauldyngworth, North Ingelby and Torkesey, Linc., draper or husbandman, 27 May. John Hevenyngham, esq., s. and h. of Thomas H., esq., and of Anne his wife, d. and h. of Thos. Yard, esq., kinsman and h. of John Hevyngham, knight, and farmer of Huntyngfeld manor, Suff., undated. Thomas Howell, draper of London, and merchant of Bristol, executor of Thomas Cokkys, late draper of London, and Peter Curteys, pewterer of London, 3 June. Walter Culpeper, Colepepyr or Culpepyr, of Lossenham, or Losenham and Gouthehurst, Kent, esq., late steward of Calais, 12 June. Alex. Culpepyr, Colepepyr, Culpepur, Collepepur or Colpeper, of Gowtheherst, Kent, and London, esq., 12 June. Henry Whyttokysmede or Whitokesmede, of Bymaker and Mikkesham, Wilts, and Wellow, Soms., g., late bailiff of Trowbrigge in the Duchy of Lancaster, 20 June. Wm. Wellysine, of Hull, Yorks, merchant, merchant "venterer," g. or y., 10 June. Hugh Culme, Columb, Cullum or Cullam, of Southmolton and Molland Champiaux, Devon, gent., 6 June. Thomas Weldysshe, of Egerton, and Lynton, Kent, corn buyer, husbandman, clothier, clothmaker, merchant, y., franklin or clothman, 12 June. Humphrey Dounton (repeated as on m. 13). Wm. Barantyne, of St. Clement's parish without the bars of the New Temple, London, and Parva Hasle, Oxon., s. and h. of John B., of Parva Hasle, Oxon., gent., and Mary his wife, and kinsman and h. of John Barantyne of Chalgrave, Drue Barantyne and Elizabeth Botyller, 12 June. Thomas Cheyne or Cheyne, late of Ferme Dytton, Camb., Irtillyngborowe alias Artilborow, Ntht., and Stopenheth, Midd., k., 29 June. John Warde, of Northeyghton, Yorks., esq., late receiver of the honor of Pontefract and Knaresborough and of Houeden and Houedenshire. and Isabella his wife, late the wife and executrix of Nic. Middelton, 10 July. Thomas Hurtsky or Hurteskye, prior of Watton and master of the Order of St. Gilbert, and master, rector or governor of the house of Semplyngham, and all the priors of that Order, viz., of Harveholme, Chikesand, Cattellea, Lyncoln, Bulyngton, Syxhill, Ormesby, Almyngham, Newstead (de Novo Loco), Watton, Malton, St. Andrew's of York, Maresia, Clattercote, Holandbrigge (de Ponte Aslaci), Merleberg, Shuldham, Elreton, Fordham, Well, and St. Edmund's of Cambridge, 5 July. Thomas Baker alias Spycer. late of Bristol, grocer or merchant, administrator with John Hutton of the goods of Maud Baker alias Spycer, executrix of Thomas Baker alias Spycer, of Bristol, merchant grocer, 12 May. John Vaughan or Vaghan, late of Bristol, merchant, late bailiff, mayor, escheator and constable of the Staple of Bristol, executor of Henry Vaughan, John Esterfeld and Richard Vaghan, merchants of Bristol, 12 May. John Smyth, of Oxone or Hoxon, Suff., yeoman, and Margaret his wife, 12 June. Thomas, the prior, and the convent of Old Carmerdyn, 10 June. Richard Neuporte or Newporte, of Salisbury and Winchester, clk., executor of Thomas Langton, late bp. of Winchester, 16 June. John, the abbot, and the convent of Redyng, 12 June. John Pere alias Banbury, abbot, and the convent of Bruern, 12 June. John Burley, or Burlee, late of Vyes (de Vyes, i.e. Devizes), gent., late gentleman usher of Henry VII., 12 June. John, the prior, and the convent of Barnstaple, 12 June. John Ryse or Res, clk., canon and prb. of Exeter cathedral, dean of the royal free chapel or college of St. Beriane, Cornw., canon and prb. of the collegiate church of St. Mary de Otterey, Exeter dioc., and of the royal free chapel of Boseham, Chichester dioc., prb. of Hays in the Castle of Exeter, prior, master or keeper of the hospital or house of God and St. Nicholas of Portesmouth, Hants, master or keeper of the free chapel of St. James of Kyngeston Russell, Dors., rector of Samford Courteney, Exeter dioc., and Hadlegh, Suff., executor or administrator of the goods of Cardinal Morton, undated. John Clervaux, Clerevaux, Clarevaux, Clarves, or Clerves, of Croft in Richmond liberties, Yorks, jun., esq., s. and h. of Marmaduke C., esq., 1 July. Anne Rames, widow, late wife of Robert Rames, esq., dec., 1 July. Ralph Wyclyff, Wiclyff, or Wyclyffe, or Wiclif, of Wyclyff, Yorks, and Wermouth, Dham., esq., s. and h. of Robert, undated. Henry Cobbe, late of Dertford, Kent, y., husbandman or woodmonger, 5 July. Miles Lambert, mayor, and the burgesses of Leicester, 9 July. Robert Rawlyn or Rawlyns alias Cope, of Porchester, Hants, London, Petworth, Suss., Southwark, Surr., and Calais, y., 7 July. Robert Bures or Buresse alias Bukke, late of Foxherth, Essex, etc., esq., 4 July (vacat quia alias irrotulatur). Julian Serrystorii and Guido Portinary, merchants of Florence, late of Bruges and London, 1 July. Anne Delavale or Delavalle, of Seton Delavale. Nthld., widow of Thomas Hopton, esq., 9 July. George Pierpount, of Lanford. Notts, and Hardewyke next Bishop's Lenn and Norwich, Norf., gent., and Joan his wife, relict of Richard Pepir, formerly merchant of Norwich, who was executor with Wm. Portlond, chaplain, of Margaret Portlond, widow and administratrix of Robert Portlande formerly alderman of Norwich and late of Aylesham, Norf., 5 July. Stephen Coope, of London, and Cayo, Surr., g., serjeant of the Pantry, late serjeant of the Cellar of Henry VII., 20 June. Wm. Eyton, Eton or Heyton, of Heyford, Ntht., and Chorleburyt, Oxon., g., and Margaret his wife, late wife and executrix of John Mauntell, esq., 26 May. Henry Patmer alias Brigges, of London, draper or clothmaker, s. of Wm. Brigges alias Patmer, of Great Hadham, Herts, yeoman. 1 July. Richard Yngram or Ingram, prior, and the convent of Penmon, co. Anglesea, 2 July. Christina Fauntleroy, prioress, and the convent of Amesbury, 20 June. Adrian Cardinal of St. Grisogonus, bp. of Bath and Wells, alias bp. of Hereford alias Adrianus Castellensis or Adrianus de Italia, 1 June. John Audeley alias Tychet, late of Stowey, Soms., Clerkenwell, Midd., and Wolwyche, Kent, esq., s. of John late lord Audeley, dec., and brother of James lord Audeley, dec., 13 June. Philip Calthorp, of Norwich and Manyngton, Norf., k., s. and h. of John C., of Netylstede, esq., 21 May. Edmund Stubbe, clk., S.T.P., master or keeper of Gunvile Hall in Cambridge, rector of St. Michael of Coslany in Norwich, executor of John Barly, S.T.P., and the fellows or scholars of Gunvile Hall, 21 May. John Barnes or Barneys, of Hevenyngham and Fynchyngfeld, Essex, esq., and Elizabeth his wife, late the wife of Robert Corbet, late of Assyngton, Suff., esq., 20 June. Thomas Vaughan, of Dover, Cryk in the lordship of Chepstowe, and London, soldier of Calais, bailiff of Dover, y. or "waterbayle," 28 June. Richard Wode, of Londonmerchant, merchant of the Staple of Calais or g., 1 July. Wm. Blount, Blyunt, Blont or Blonte, of Glaseby, Wadeslex, Kynlet, Brigenorth and Bleseby, Salop, esq., 8 June. Anthony Babyngton, Babyntun, Babinton, or Babenton, of Dethyk or Dedyk, Derb., Kynston and Norvell, Notts, and London, g., and Katharine his wife, late the wife of Thomas Coton and lately called Katharine Ferrers, 31 May. Richard bp. of Hereford, alias Ric. Mayewe, S.T.P., late almoner of Henry VII., president of Magdalen College and chancellor of Oxford University. 4 May. John Langton alias Gerves, abbot, and the convent of St. Mary Graces next the Tower, 3 June. John a Dene, prior, and the convent of Mottesfount, 28 June. Wm. Spence, of Croft and Richmond, Yorks, clk. or chaplain, 19 June. John Bowrgchier, k., lord Berners, of Honesdon, Herts, and Westminster, 18 June. Thomas Lyneham or Lynham, of London, and Hertford, Bewdesert, Staff., and Ludlow, Salop, late clerk controller of the household of Arthur late Prince of Wales, 1 July. Thomas Leman, of Walpole, Norf., and Cambridge, scholar, clerk, vicar of Walpole, late rector of Southacre, Norf., and of Alderton, Suff., steward of the household of James Hobart, knight, 28 June. Thomas Wolsey, clk., dean and the chapter of Hereford, 4 June. Henry Grymstun or Grymston, of Gedyngton and Whytfeld, Ntht., and Watton, Herts, y., 30 June. John Deyman, of Torbryan, Devon, singleman, sawyer, or labourer, 26 June. Simon Cenose or Senus, prior, and the convent of Carlisle cathedral, 28 June. Edward Skydmore or Skyddemore, of Nether Sydynton and Coberley, Glouc., and Homlacy, Heref., and Isabel his wife, alias Isabel Ketilby, widow, alias Isabel Lymbryk, alias Isabel Langley, one of the ds. and hs. of Edmond Langley, 24 June. Thomas Hubart, Hubard, or Hobard, of Qwaplede parish, Linc., merchant tailor of London, merchant of the Staple of Calais, alderman of Calais, and Christina his wife, executrix of Thomas Benet, dec., late merchant of the Staple and alderman of Calais, 20 June. Robert Bures or Buresse of Foxherth, Essex, Clophill, Suff., and London, esq., and Robert Buk or Bukke, late of London, gent. and principal of New Inn without the bars of the New Temple, 4 July. Thomas Busshe or Bosshe of Ogborne St. George, Wilts, woolman or yeoman, one of the executors of John Godard, late of Ogborne, woolman, and of Wm. Mydwynter, of Norlache, Glouc., woolman, 16 June. John Hungerford, of Downe Amney, Glouc., etc., k., 25 May. Joan Boysse or Boys, widow and executrix of Walter Boysse, late of Taunton, merchant, 15 May. Richard Norton or Nortown, of Est Tysted and Nutley, Hants, esq., 6 July. George Butlar, Boteler, Botler or Butteler, of Bromefeld, Essex, g., 15 Dec. Chr. Westell, of Smertdale in Kyrkby Staven parish, and Burgh under Stanmore, Westmld., y. or labourer, 20 Nov. Robert Rumney or Romney, shoemaker or y., and John Eire or Eyre, labourer, "warier" or y., of Tetbury, Charyndon and Averyng. Glouc., and Mawmesbury, Wilts, 10 Nov. Wm. Wryght, of Sohome or Some, Camb., husbandman or y., 12 Jan. Hugh Thurston, of Boxele or Boxsele, Kent, labourer 10 Dec. (Knoll). Robert Lynne, of Some, Camb., and Tyttelsale and Swafam Market, Norf., mercer or y., 12 Jan. Nic. Benburry, Benbury or Benbery, of Dunmowe Magna and Hengham ad Castrum, Essex, y., a groom of the chamber of John earl of Oxford and s. and h. of John Benbury, 12 Jan. John Hyggecoke, Hyggecokkes or Hyggecokes, of Basingstoke, Hants, and Newbery, Berks, dyer, 12 Nov. John Horner, of Lygh super Mynydemp, and Donhed, Soms., clothier or y., executor of Robert Horner, late of Lye, clothier, 24 Nov. Edmond Strynger or Stringer, of Worcester, and Cicestre, Glouc., sherman, 12 Nov. Reynold à Chamber, Chaumbre or à Chaumbre, of Southampton, g. or y., late soldier of Calais, 20 Nov. John Weston, of Exeter, Batell, Suss., and Breknok in Wales, y., 23 Nov. Hugh Walter of Great Fakenham, Suff., y. or husbandman, tenant of lands which were of Richard Walter and Alice his wife in Fakenham, Sapton, Euston, Honyngton and Fakynham Parva, Suff., 20 Jan. Wm. Erneys, of Middelton Erneys, Beds., and London, g., 18 Jan. John Sote alias Sote Johnson, of Rochester, hardwareman, late of Barowe in Brabant, 22 Jan. Wm. Aylnoth, Aynoth, Ayloff, Ayluff, Alluff, Ayloth, Aylwyn, Alwyn, Ayleff, Aylyff or Aylnouth, of Mulsham, in Chelmsford parish, and Gosfeld or Gesfeld, Essex, and New Market, Suff. (sic), innholder, y. or g., 20 Jan. Richard Jenyns, prior, and the convent of Maiden Bradley, Wilts, 26 Jan. Simon Robynson, of Melbourne and Melreght, Camb., and London, clk., 20 Jan. John Kyng or Kynge, of Wederffeld or Waderffelde, Essex, husbandman, 26 Jan. James Bodenham, of London, draper or merchant, and Joan his wife, late wife of Richard Wymond, late grocer, of London, 12 Jan. Henry Raper or Raperr, chaplain of the perpetual chantry of St. George of Romsey, Hants, 15 Feb. Mayor, burgesses and commonalty of Toryton, Devon, 10 Feb. John Ferrour, of Hermounceux, Surr. (sic), "cordyner," 16 Feb. Thomas Swane, late of Feyrfyld, Heyrfyld and Derby, Derb., husbandman, y., "wryght," or labourer, 20 Feb. John Fouhell, Fowhell, Vowell, Fouhell, or Fowell, senior, of Uggeborough, Devon, Holbourne, Midd., Hedingham, Essex, and Lavenham, Suff., g., 12 Feb. Ralph Hakulette. Hackelette, Hakelette, Hackelet or Hackellette, of Greslame, Stone Gamage, Twyforde and Luctone, Heref., esq., 3 Oct. Ranulph Eggerton, of Wrynehill, Boteldy, Wrymhyll and Wrynehall, Staff., g., 24 Feb. Benedicta Osmonde or Osmond, of Wolverhampton, Staff., London, and Bewedeley, Salop (sic), widow, relict of John O., late of London, merchant, 15 June. Katharine Pekeryng, of Barowe Halle, Kirby Kendall and Markyndell, Westmld., Beverley, Yorks, and St. John's Street, Midd., widow, 12 June. Edward Byrde or Bryd, of Gaisley, Hausted and Bury St. Edmunds, Suff., y., 21 May. David Owen, bp. of St. Asaph and abbot of Conway, Peter Connewey, clk., archd. of St. Asaph, rector of Northop, co. Flint, commissary of the said bishop, and Robert ap Rees ap Meredith, clk., rector of Llanvawre in Penllen and of Denerth, general commissary and official of the said bishop, 10 July. George Clerk, alderman and mercer of Norwich, executor of Robert Thorp, alderman of Norwich, and of Agnes Thorp, late wife of the said Robert, 21 July. Henry Fane or Vane, of Tunbregge and Hadlowe, Kent, and London, g., 16 July. Edward Garth or Gerth, of Pensherst, Kent, g., 12 July. Gregory Norwiche, prior of Busshemede, rector of Alfyngton, Devon and Kyslyngbury, Ntht., and the convent of Busshemede, 16 June. Katharine Huddesfeld, of Shyllyngford and Exeter, Devon, widow and executrix of Wm. Huddesfeld, knight, alias Kath. Rogers, late wife and executrix of Thomas Roggers, late of Bradford, Wilts, serjeant at law, and George Rogers, of Shyllyngford, esq., s. of the said Thomas, 12 July. John Furlang, Furlong, or Furland, of Colbroke, Kirton and Exeter, Devon, y. or miller, 22 July. Robert Benet, Bennet, Bennyt, Beynnet or Beynet. of Seyghtforth, Suff. (sic), Caldewell and Bedford, Beds., Byrmycham and Kynnesbery, Warw., and Bloyscwych, Staff., y., butler or tailor, 22 July. Richard Tothe or Toth, of Chepsted in Chevenyng or Shevenyng parish, Kent, "ryppier," "ryppier," husbandman or yeoman, 20 July. Laurence Pilcherd, of Redyng, Berks, and Hertfeld, Suss., fuller or labourer, 26 July. John Fowler, of Shakston or Shakerston and Wellesborough, Leic., g., clerk of the peace in co. Leic., 5 July. Robert Sheffeld, of London, Butterwyk, Linc., and Chylwell, Notts., k. (s. and h. of Robert S., esq. 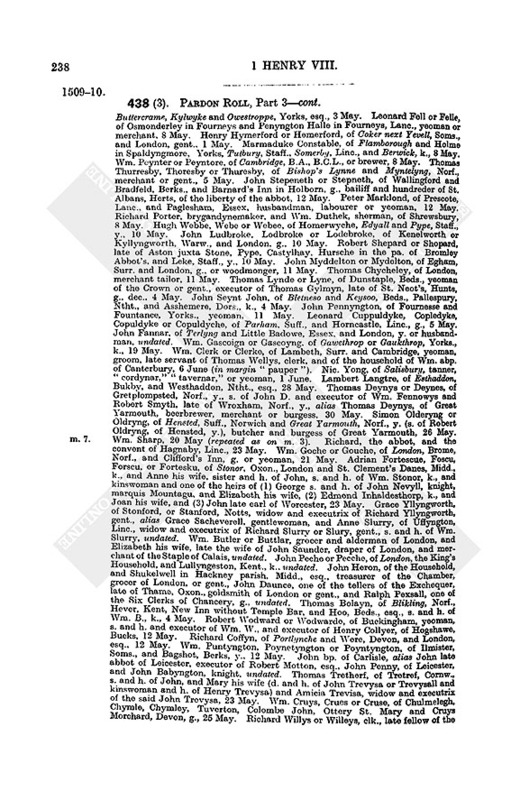 ), constable of Lincoln castle, etc., and Ellen his wife, kinswoman and h. of John Babyngton, knight, and d. and h. of John Delves, knight, and kinswoman and one of the heirs of Roger Hillarii, k., 5 July. Henry Marny, of Leyre Marny or Merny, Essex, and London, k., 16 May. Roger Harlakynden of Wodechurch, Kent, London, and Erthyngleygh, Suss., g., 6 July. Thomas Whyte or Wyte, of Coventry, London, Bristol and Hull, fishmonger, grocer, mercer or merchant, 20 July. Richard Mareld, Meryll, Mayreld or Merell, of Milende next Colchester, Essex, husbandman or y., 26 June. Wm. Warde or Ward, of Barnalbey, Barnabey next Waltham and Grymesby, Linc., butcher or y., 16 July. Thomas Morton, Moreton, Mouretone or Mordon, of Hereford, clk., 13 June. Henry Hornby or Hornbe, clk., alderman, and the brethren of the Guild of St. Mary in Roston or Baston, Linc., 14 July. John Lancastre, prior, and the convent of Launde, 12 July. Wm. Comton, the abbot, and the convent of Pershore, 12 July. John Clerke, of Coventry, London, Abbottes Henley, Staff., and Shewrisbery, Salop, grocer or merchant, 20 July. George Macworth or Makworth, of Empyngham, Rutl., esq., 12 May. Humphrey Fitzherbert, of Bryhall, and Braughyng, Herts, Mounteneisyng, Essex, Mepsale, Beds., and London, g., and Dionisia his wife, d. and h. of Henry Elveden, 20 July. Chr. Brone, Broun, Browne or Brome, of Halton and Wodestok, Oxon., Hartwell, Bucks, and London, esq., 24 July. Wm. Geffrey or Jeffrey, of London, Benyngton and Fryskay, Linc., and Lamhith, Surr., mercer or gent., 18 June. John Marny or Marney, of Leyre Marny, Essex and Cambridge, esq., executor of Elizabeth Harmanson, late of Colchester and esquire for the Body, 16 May. Thomas Mangall or Mangalle, of London, and Pontfrete, Yorks, grocer or merchant, 28 July. Robert Bekyngham or Bekingham, of London, Guldeford, Surr., Olde Braynford in Elyng parish, Midd., Bromley, Kent, and Newton, Surr., grocer, merchant or yeoman, 28 July. Lady Anne Greysley or Gresley, late of Colton, Staff., widow and executrix of Thomas G., late of Drakelowe, Derb., knight, 10 June. John Gydman, of Southwark, tailor, 16 July. Ralph White, of Wolsyngham in Wardall, Dham., y. or husbandman, 26 July. Ralph Rerysby, Rerusby, Resby or Rerisby, of Theryber, Ryber or Thirber, Yorks., and Asshewer, Derb., esq., 27 July. Anne, the abbess, and the convent of Pollesworth, Warw., 24 July. Richard Page, prior, and the convent of Ivychurch, 30 July. Thomas Grene. S.T.B., master, and the fellows of St. Katharine's Hall in Cambridge, 30 July. Stephen Bull, late of Olderadnor in Walton parish, marches of Wales, and London, g., "man of warr" or esq., 26 June. Wm. Smyth alias Colyn, of Merpole, Devon, thatcher, undated. Agnes Morton, of London, widow and executrix of Robert Morton, late of London, gent., executrix of Agnes Foster, late of London, widow, administratrix of the goods of John Feld, late of London gent., and tenant of the manors of Putteney Lorcy, Soms., and Stepulhall, Essex, 20 July. Richard Chaufer, of Rosedale in Blakamore, Yorks, stockfishmonger of London, merchant of the Staple and burgess of Calais, late mayor of Calais, 28 July. Roland Ferrour or Ferrer, of Wolsyngham in Wardall, Dham., y. or husbandman, 6 July. John Monke or Monk, of Enfeld, or Envilde, Midd., y., 28 July. Thomas Skarlet, abbot, and the convent of Byley, 27 July. Thomas Twysaday, Twysdey or Twysadey, of London, esq., serjeant at arms, 30 July. Humphrey Stafford, of Codrede, Herts, Bletherwyk, Ntht., and Graffton, Worc., esq., 10 July. Thomas Stafford, of Totenhoo, Bucks, esq., Dodford, Ntht., and Graffton, Worc., 10 July. Wm. Melton or Meelton, of Some or Soome, Camb., weaver, yeoman, or husbandman, s. and h. of Wm. M., late of Some, weaver, 28 July. John Dorceter, Dorcestre or Dorcetur, of Over, Camb., husbandman, pulter or fisher, 15 July. Henry Trefens, or Trevyns, of Trefyns, Cornw., yeoman, franklin or tinner, s. and h. of Alan T., 4 July. Thomas Denys or Denes, of Holcombe Burnell, Devon, esquire for the Body, and Anne his wife, late the wife of Edward Wode, grocer of London, 6 July. Richard Avenand or Avenon. clk., vicar of Chepyng Lamburne, Berks, 1 Aug. Elizabeth Moresby, widow of Chr. Moresby, k., late of Wynunderwath, Westmld., 8 July. John Webbe or Weeb, or Meshebury or Mashebury, Essex, husbandman, 25 July. John Thystylthwayte, of Great Myssenden and Bokensfeld, Bucks, tailor or yeoman, the King's bailiff itinerant in cos. Beds, and Bucks, keeper of Aylesbury gaol, late bailiff of the three hundreds of Chiltern, Bucks., 28 July. Richard Smyth, of Bobyngton, Staff., and Litell Dene, Glouc., husbandman, yeoman or mercer, 28 July. Robert Tredenek, Tredennek or Trethenek, of Trevethenek or Trethenek, Cornw., g., 27 July. Wm. Shroggys or Shroggis, late of London, stockfishmonger, late merchant, burgess and mayor of Calais, 4 July. John Johnson alias Robert Johnson, of Canterbury, husbandman, smith or farmer, 30 July. Richard Broun or Browne, of London, grocer, merchant of the Staple and burgess of Calais, and Anne his wife, late wife and executrix of John Haward, late of Calais, soldier, and of Wm. Bolton, late burgess and soldier of Calais, undated. Thomas Gerrard, Garrard or Gerrad, of Chepyng Wicombe, Bucks, gent., clothier or merchant, 1 Aug. Mayor, etc., of Chester, 4 Aug. John Eston, of London, Stenyng, Suss., and Kebolton, Hunts., cooper, King's cooper (cuparius noster), administrator of the goods which were of Wm. Pellet, late of Stenyng, Suss., yeoman, 15 June. Thomas Sutton, late of Worsworth and Somershall upon the Hill, Derb., and London, y., 6 Aug. Wm. Bulla, Bulley, Bully, Bulle or Bullow, of London, mercer or merchant, 21 July. 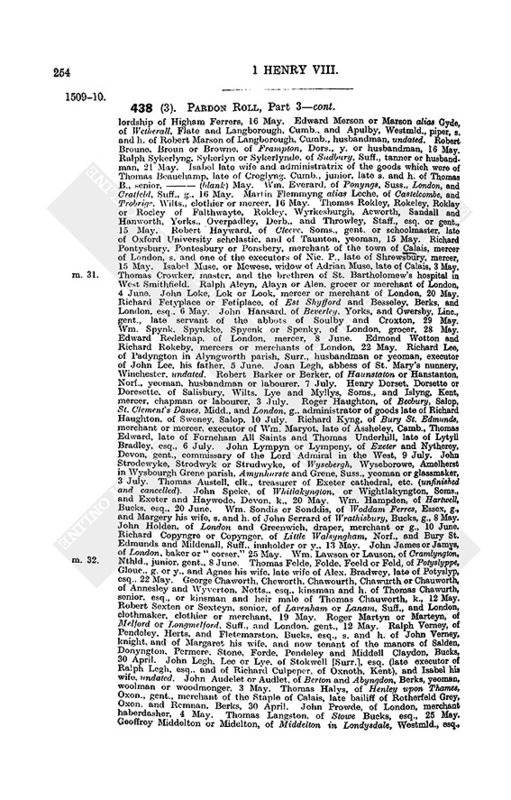 Robert Badcok, of Hawkehurst, Kent, husbandman or yeoman, 1 Aug. John Aspelon, Asplon, Asplond or Aspelond, of Heyden, Wybenhoo and Hevyngham, Essex, and Boxford, Camb., g., 7 Aug. John à Meles, Ameles or Meles, late of Bukherst, Berks, and London, husbandman or labourer, 8 Aug. Wm. Wilberham, Wilbram, or Wilbram, of Woddey and Fadyleigh, Chesh., Norton and Tunstall, Salop, and London, esq., _ (blank) Aug. John Husee or Husey, of Southampton and London, g., or merchant, 20 July. Fulk Lee or Legh, of Lagley, Pleisshe and Lee, Salop, esq., 19 July. John Holgrave, of London, mercer, merchant of the Staple of Calais, gent., 4 Aug. John and Otwell Hegynbothum, Hegenbothon, Hegunbothum, Heginbothom or Hegingbothom, of Marpole or Marpull, Chesh., Whygmore, Salop, and Bewley, Hants., y. or husbandmen, 5 Aug. Thomas Berwell, abbot, and the convent of Buttlesden, 1 July. Wm. Brown, Browne, Bron or Brone, junior, esq., alderman of London, mayor of the Staple of Westminster, merchant of the Staple of Calais, s. and h. of John Brown, knight, 8 Aug. John Cawston or Causton, of Hunstanton, Norf., yeoman or labourer, 3 Aug. Wm. Prat or Pratte, late of Westbernyn, Surr., and Leneham and Oternden, Kent, g., and Alice his wife, late wife and executrix of James Aucher, late of Oternden, Kent., gent., 20 July. Nic. Cwre, of Snetysham and Hunstanton, Norf., yeoman or tailor, 4 Aug. Richard Hovyll, of Causton, Norf., yeoman, 1 Aug. John Olyff alias John Horsekeper, of Elsyng, Norf., 1 Aug. Anthony Melton, abbot, and the convent of Heyles, 10 Aug. Thomas Barowe. Baroo, Barrowe or Baro, of Chester, merchant, undated. Reynold Pekham, of Wroteham or Wrotham, Kent, esq., 12 Aug. Chr. Swanne, of Abyngdon, Berks, draper, grazier, clothmaker or yeoman, 13 Aug. Thomas Merable, Merrabull, Merabull or Merrable, of Ware, Herts, and London, fishmonger, 12 Aug. Walter Hackeluyt, Hakeluyt, Hokkelet or Hakelet, of Leominster, Heref. and Gloucester, g., 12 Aug. Katharine or Lady Katharine Gordon, widow, late of the household of Henry VII., d. of George late earl of Huntley in Scotland. 10 Aug. Wm. Bette or Bet, of Barford, Noryell and Wardon. Beds., labourer, parish clerk, servingman or husbandman, 12 July. Wm. Goldsmyth alias Smyth, of Gloucester, Magna Marcle, Heref., and Worcester, goldsmith, alderman or merchant, 10 Aug. Master, brethren and sisters of the guild of Holy Cross in Abingdon, Berks, 14 Aug. Thomas Hedde, Heed, or Hed, clk., advocate of the court of Canterbury, "iconemus" or master of the hospital of St. Mary of Meleton next Gravesend, vicar general sede vacante of Winchester diocese, commissioner of the jurisdictions of St. John and St. Katharine near London, and official of the archd. of Mid dlesex and bp. of Rochester, late of Oxford and perpetual vicar of Colerne, Wilts, executor of Philip Coklond, late of Lincoln, 16 Aug. John Wright or Wryght, master or custos, and the fellows of the hall or college of Holy Trinity in Cambridge of Norwich, 13 Aug. Thomas Triggean, Tregean, Trorean or Trigen, of Trurue, Cornw., merchant or g., 13 Aug. John Stanland, Stanlond, or Standland, of Caernarvon, Anglesea, Merioneth, and Hardlaugh, co. Merion., y., 18 Aug. Alex. Plymmeley, Plomeley, Plemeyley or Plymeley, of London, mercer or merchant, 27 July. John Hauker, Hawker, or Haweker alias Webbe, of Ilmyster, Soms., merchant, yeoman or weaver, 21 Aug. Wm. Smyth, abbot, and the convent of Great Missenden, 13 Aug. Thomas Narke, of Woursted, Worsted or Wusted, Norf., "worsted wever" of "wustedwever," 21 Aug. Thomas Archer, of Taunton, Soms., Exeter, and Alton, Hants., dyer, clothier or merchant, 20 Aug. John Coke or Cooke, of London, mercer or merchant, 1 Aug. John Scarlet or Scarlett, of London, tailor, hosier or merchant tailor, 14 Aug. John Brampton or Bramton, alias Hewster, Heustor or Hewester, of London, mercer, executor of John Martyn. clk., late archd. of Salop, 10 Aug. Thomas Thompson or Tomson, of Strodewater, Glouc.,- clothman, merchant, y. or minstrel, 24 Aug. Nic. ap David ap Gwyllyam, of Llysdullas and Aunlough parish, co. Anglesea, and Hereford, esq., 23 Aug. John Belchamber, of Basingstoke, Hants, yeoman or mercer, 21 Aug. Thomas Denby, of Dene, Hants, clk. or chaplain, 21 Aug. Richard Assheley alias Touker or Towker, of Waldyche next Birtport, Dors., husbandman, 22 Aug. Francis Calthorpp, of Weybrede, Suff., esq., s. and h. of Elizabeth Calthorpp, d. and one of the hs. of Miles Stapilton, knight, 13 June. John Baffe, Baff or Baf, of Deane or Dene, Hants, husbandman or y., 12 May. Wm. Rocheford, of London, grocer, merchant or gent., s. and h. of Robert R., late grocer of London, 25 Aug. Laurence Yngham, prior, and the convent of Felley, 8 Aug. John Alen, Aleyn or Alan, of Truru, Cornw., carpenter, husbandman or merchant, 1 Aug. Ralph Davenport, Daunport or Davinport, of Davenport, Chorley and Merton, Chesh., esq., 18 Aug. John Sampson or Samson, of London, fishmonger or merchant, 23 Aug. Thomas Emson, of Toucestre and Althorp, Ntht., esq., 21 Aug. Wm. Mershe, Marshe or Meshe, late of Caernarvon, y., s. and h. of Wm., 29 Aug. John Rest, of London, alderman or grocer, 29 Aug. Roland Stokhawll, Stokhall, Stokhole or Stokhale, of Beverley, Bysshopburton and Cotyngham, Yorks., y., 27 Aug. Henry Bulde or Bolde, gent., clerk of the exchequer of Caernarvon, 29 Aug. Thomas Gybons, Gebons or Gybbons, of Hereford, merchant, mercer or grocer, 27 Aug. Thomas marquis Dorset, alias Th. Gray, k., lord Ferrers of Groby, Haryngton, Bonvyle and Astley, s. and h. of Th. late marquis of D., 20 Aug. Walter Colyns, of Oxford, Abyngdon, Berks, and Holbourne and Westminster, Midd., husbandman, 24 Aug. Elizabeth Hull, abbess, and the convent of Westmallyng, Kent, 30 Aug. Henry Frer or Frere, of le Devysez, Wilts, clothmaker or g., undated. Joan Poyle, of Tregony, Cornw., widow, executrix of Thomas Poyle and of Thomas Tregarthen, esq., 28 Aug. John Benstede, abbot, and the convent of Whitby, 28 Aug. Thomas Crispe, Crippis, Crypse or Cripps, of London, mercer or merchant, 12 Aug. John Streynsham, Streynesham, Treynsham or Straynesham, late of Monmouth, clk., vicar of Lyme Regis, Dors., prb. 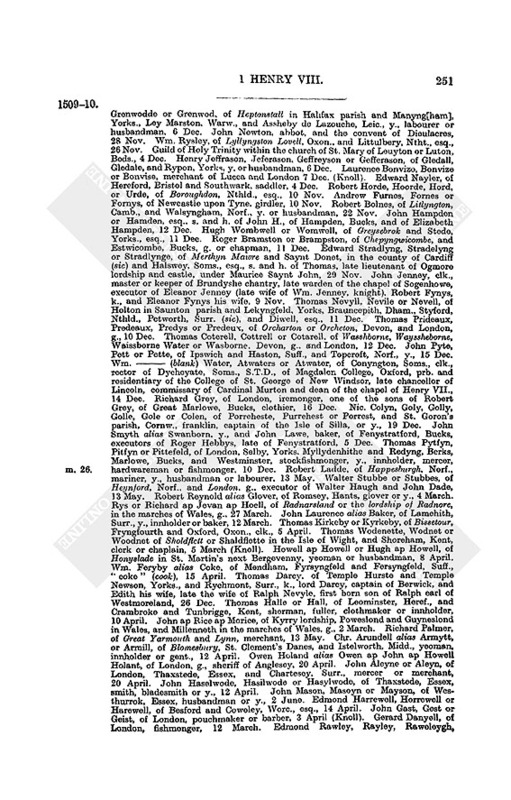 of Dyndor, Soms., 15 Aug. John Grenewod or Grenwod, of Heptonstall, Yorks, y., 24 Aug. John Oughan, Owgan, or Owen, late of Dedham Magna, and Hatfeld Episcopi Herts, yeoman or "corser," 8 June. Henry Hornbye or Hornby, clk., master, and the scholars of St. Peter's College, Cambridge, 21 Aug. Richard Sidnor, clk., M.A., canon and prb. of Exeter, executor of John Arundell, late bp. of Exeter, 14 Aug. Philip Warton, of Tewkesbury, Glouc., Clement's Inn, Midd., and London, g., s. and h. of Philip, 12 July. Robert Reke, Ryke or Rike, of Calais, draper or merchant, native of the county of Guisnes, 20 June. Dean and Chapter of Wells, 4 Aug. John Perot or Perott, clk., precentor of York cathedral, prb. of Driffeld, archd. of Colchester, rector of All Saints in Waldham, Kent, late commissioner of exchequer of Thomas abp. of York, and official of the consistory of Rochester, 28 Aug. Thomas Lepyngton or Leppyngton, of York, Hull, Beverley, Fymbre and Fymmer, Yorks., g., yeoman or scrivener, clerk of York castle, 28 Aug. Thomas Sheryff, chaplain of St. Mary and St. James of Coubyth, Coubygh or Coubit, in Spaldyng parish, Linc., 25 Aug. Richard Johnson, of Boston, Linc., late scholar of Magdalen College, Oxford, and servant of George Kyrkham, late clerk of the Hanaper, 12 Aug. John, the abbot, and the convent of Coverham, 24 July. Robert Wyngfeld, of Shelfanger and Estharlyng. Norf., Letheryngham, Suff., and London, k. or esq., 20 Aug. Geoffrey ap Eden ap Howell ap Jevan. dwelling in the town of Llaneaber in the commote of Ardudwy. co. Merioneth, gent., undated. John Gander or Gandyr, of Winchester, g., 21 Aug. Cecilia Soome, widow and executrix of Edmond Soome, late of Lynn, morchant, 8 Aug. Thomas Weyle, clk., bp. Padavensis and suffragan within the diocese of Coventry and Lichfield, vicar of Nenneton, Warw., rector of Cartelyng, Camb., 1 Aug. Henry Dale, alderman and merchant of Bristol, 25 Aug. Roger Colier or Colyer, of Cernefleld and Almeley, Heref., husbandman, s. and h. of Richard C., of Almeley, Worc., 8 Sept. Thomas Barton, of Webley and Aston, Heref., gent., 8 Sept. Richard Willoughby, chaplain, and John Tod or Todde, late of Morpeth, administrators of the goods of John Graistoke, lord of Graistoke, alias John Graistok, of Morpath or Graistok, k., who died intestate, 5 Sept. Thomas Burlas, Burlace, Burlase, Burlaas or Borlas, of Burlas Burges, Cornw., franklin or gent., s. and h. of Thomas, 16 Aug. Robert Mathewe or Matheu, of Croydon, Surr., husbandman, "cordewener" or "coliar," 1 Sept. John Moreton or Morton, of Brakynburght, Brakenborowe and Hareford, Midd., Moreton, Chesh., and London, esq., 26 Aug. Peter Haberden, Habirden, Abyrden, Habardyn or Aberden, merchant of Bristol, 28 Aug. John Briand, Bryant or Briant alias Crocker, of Lostwytheel or Lostythiell, Cornw., merchant, mercer or yeoman, 16 Aug. Stephen Ronold, Ronell or Ronald, of Lostithiel, Cornw., franklin, yeoman or tin merchant, 16 Aug. Thomas Langley, of Bukfast Lee or Bukfast Light, Devon, weaver or thatcher, 12 Sept. Alice Quedyngton or Quedampton, of Estwodhay, Hants, spinster, alias Alice Howett, singlewoman, alias Alice Hancok, spinster, alias Alice Langosok, singlewoman, 16 Aug. John Aubrey or Awbrey, of London, Taunton, Soms., Dalley and St. Clement's Danes, Midd., and Haldershote or Aldershot, Hants, g. or esq., 24 Sept. Raphael Squarscfigo, Squarsifigo or Squarsafigo, of Genoa and London, merchant, 11 Sept. Eustace Knyll, late of London, Lytlyngton Midd., and Aldershott, Hants, mercer or merchant, 24 Sept. Edmond Proktour, Procter, Prokter, Proctyr or Proctor, of London, baker, 11 Sept. John Scrope, of Castelcombe, Wilts., Aston, Worc., Harston, Camb., Oxmendon, Oxmanton or Oxenden, Glouc., esq. or k., s. and h. of Stephen Scrope, esq., 30 Aug. John Neuman or Newman, of Bristol, butcher or y., and Joan his wife, lately called Joan Lee, 10 Sept. Richard Walter or Ap Gualter, of New Carmarthen, merchant, 20 Sept. John Villers, of Brokesby, Leic., and London, esq., 18 Sept. Roger Alen, Alyn or Aleyn, of Watlyngstrete in Welyngton parish. Salop, yeoman or gent., escheator in co. Salop, 8 Sept. Barth. Seyntleger, of Ulcombe, Holyngbourne and Heryettisham, Kent, and Barnestaple, Devon, esq., and Alex. Wodd or Wood, of Tawton, Assherudge, and Holcombe Puramour alias Holcome Wormede, Devon, g., 17 Sept. Maurice Howell, of Farnham, Surr., Brynton, Berks, and Downele in Sengylton parish, Suss., y. or husbandman, 26 Aug. John Pauncefote, of Hasfeld, Glouc., Sutton, Soms., Cowerne, Heref., Bentley, Worc., and London, esq., 28 Aug. John ap Phelip ap Meredeth, of Kilsant in Lanwynno parish, within the county (sic) of Trayne, co. Carmarthen, and Llanwernache Ardaffe within the lordship of Keman, co. Pembroke, g., 28 Aug. Francis Briant, of Launceston or Downevet, Cornw., merchant or hatmaker, 29 Aug. Wm. Mugge, late of Goodherst, Kent, clothier or clothmaker, son of John Mugge, of Goodherst, and Crambroke, Kent, clothier, clothmaker or y., 20 Sept. John Boudon, Bowdon or Bowedon, of Brydwyll and Stoke, Devon, and London, esq., 3 Sept. Thomas Broun, Brown, Broune or Browne, of Haddon, Netherhaddon and Suleston, Derb. 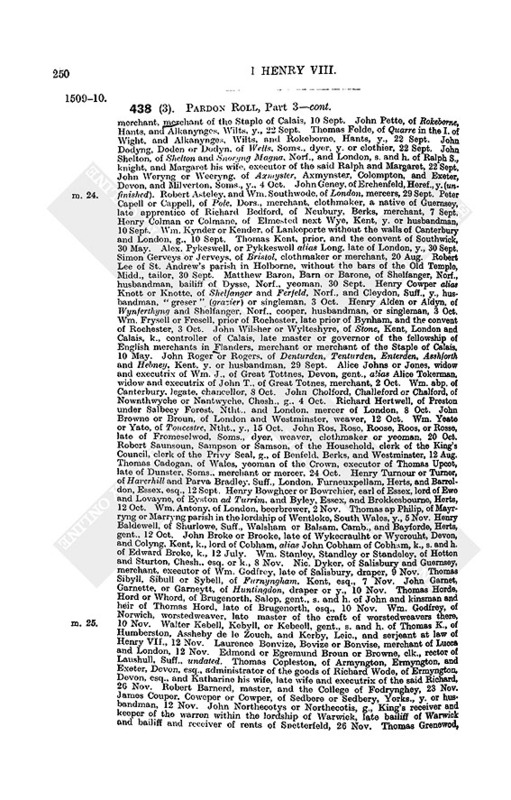 and London, y., husbandman or g., 18 Sept. Thomas Pekham, of Wroteham, Kent, London, Barnard Inn in Holbourne, Midd., and Lamehithe, Surr., g., 16 Sept. Simon Yatis, Gatis, Yates or Yatys, of Bekyngham, Linc., and Staunton, Notts., clk., bachelor in decrees, notary, official of Nottingham, or archidiaconus officialis of Nottingham, executor of Wm. Staunton, clk., brother and h. of Wm. Staunton, dec., and executor of John Yatis, late of Newark, Notts., draper, 16 Sept. Wm. Ramsey, mayor, alderman and dyer of Norwich, executor of Ric. Ferrour, late alderman there, 11 July. 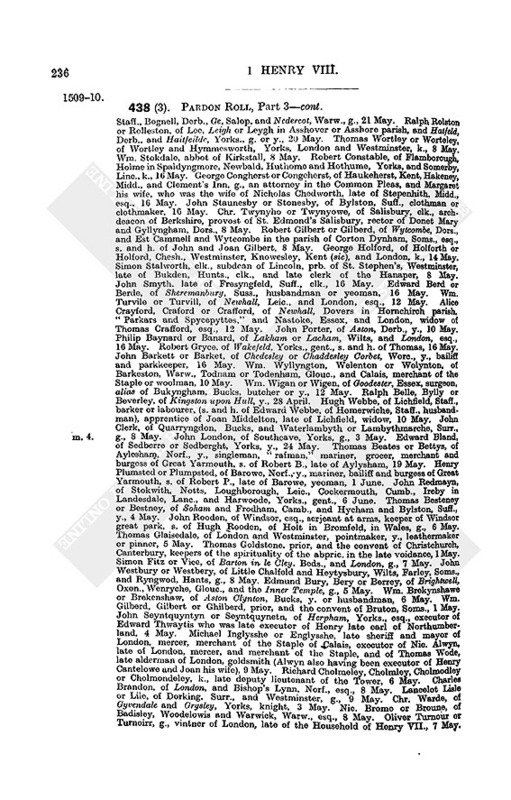 Robert Goldyng or Gooldyng, of Ebbeney or Hebbeney, Kent, yeoman or husbandman, 15 Sept. Robert Snape, Snappe or Snap, of London, skinner, ironmonger or merchant, executor of Margaret Verney, widow of John Verney, esq., and formerly the wife of Henry Hede, undated. Roger Northe, of London, merchant-haberdasher, merchant or mercer, and Christina his wife, undated. Andrew Rowland or Roweland, of Apthorp and Bulwyk, Ntht., Sawtre, Hunts, Burley, Rutl., y., 18 Sept. Richard Mower or Mowar, late of Derby, dyer or labourer, undated. John Joborn, Joborne or Jobourn, prior, and the monks of Sheen, undated. Wm. Hert, of Norwich, mercer, merchant, alderman or grocer, executor of John Cooke, late of Wolpyt, Suff., yeoman, undated. Wm. Horne or Hornede, of Apuldre, Kent, London, and Lambede, Surr., gent. or esq., 6 July. John Davy alias John Jevan ap John, of Shepwike, Dors, and Abrustruth in the marches of Wales, y., 23 Sept. John Gryffith or Griffith, of Moungumbrey and London, soldier of Calais, 24 Sept. Thomas Crull, Crulle, Cruyll, Corle or Crowle of London, grocer, merchant, merchant of the Staple of Calais, 10 Sept. John Pette, of Rokeborne, Hants, and Alkanynges, Wilts, y., 22 Sept. Thomas Felde, of Quarre in the I. of Wight, and Alkanynges, Wilts, and Rokeborne, Hants, y., 22 Sept. John Dodyng, Doden or Dodyn, of Wells, Soms., dyer, y. or clothier, 22 Sept. John Shelton, of Shelton and Snoryng Magna, Norf., and London, s. and h. of Ralph S., knight, and Margaret his wife, executor of the said Ralph and Margaret, 22 Sept. John Weryng or Weeryng. of Axmyster, Axmynster, Colompton, and Exeter, Devon, and Milverton, Soms., y., 4 Oct. John Geney, of Erchenfeld, Heref., y. (unfinished). Robert Asteley, and Wm. Southwode, of London, mercers, 29 Sept. Peter Capell or Cappell, of Pole, Dors., merchant, clothmaker, a native of Guernsey, late apprentice of Richard Bedford, of Neubury, Berks, merchant, 7 Sept. Henry Colman or Colmane, of Elmested next Wye, Kent, y. or husbandman, 10 Sept. Wm. Kynder or Kender, of Lankeporte without the walls of Canterbury and London, g., 10 Sept. Thomas Kent, prior, and the convent of Southwick, 30 May. Alex. Pykeswell, or Pykkeswell alias Long, late of London, y., 30 Sept. Simon Gerveys or Jerveys, of Bristol, clothmaker or merchant, 20 Aug. Robert Lee of St. Andrew's parish in Holborne, without the bars of the Old Temple, Midd., tailor, 30 Sept. Matthew Baron, Barn or Barone, of Shelfanger, Norf., husbandman, bailiff of Dysse, Norf., yeoman, 30 Sept. Henry Cowper alias Knott or Knotte, of Shelfanger and Ferfeld, Norf., and Cleydon, Suff., y., husbandman, "greser" (grazier) or singleman, 3 Oct. Henry Alden or Aldyn, of Wynferthyng and Shelfanger, Norf., cooper, husbandman, or singleman, 3 Oct. Wm. Frysell or Fresell, prior of Rochester, late prior of Bynham, and the convent of Rochester, 3 Oct. John Wilsher or Wylteshyre, of Stone, Kent, London and Calais, k., controller of Calais, late master or governor of the fellowship of English merchants in Flanders, merchant or merchant of the Staple of Calais, 10 May. John Roger or Rogers, of Denturden, Tenturden, Enterden, Asshforth and Hebney, Kent, y. or husbandman, 29 Sept. Alice Johns or Jones, widow and executrix of Wm. J., of Great Tottnes, Devon, gent., alias Alice Tokerman, widow and executrix of John T., of Great Totnes, merchant, 2 Oct. Wm. abp. 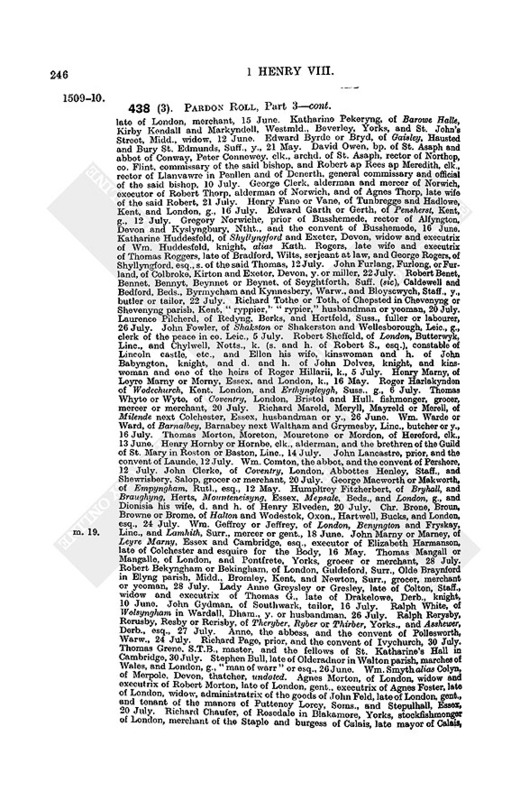 of Canterbury, legate, chancellor, 8 Oct. John Cholford, Challeford or Chalford, of Nownthwyche or Nantwyche, Chesh., g., 4 Oct. Richard Hertwell, of Preston under Salbecy Forest, Ntht., and London, mercer of London, 8 Oct. John Browne or Broun, of London and Westminster, weaver, 12 Oct. Wm. Yeate or Yate, of Toucestre, Ntht., y., 15 Oct. John Ros, Rose, Roose, Roos, or Rosse, late of Fromeselwod, Soms., dyer, weaver, clothmaker or yeoman, 20 Oct. Robert Saunsoun, Sampson or Samson, of the Household, clerk of the King's Council, clerk of the Privy Seal, g., of Benfeld, Berks, and Westminster, 12 Aug. Thomas Cadogan, of Wales, yeoman of the Crown, executor of Thomas Upcot, late of Dunster, Soms., merchant or mercer, 24 Oct. Henry Turnour or Turner, of Haverhill and Parva Bradley, Suff., London, Furneuxpellam, Herts, and Barroldon, Essex, esq., 12 Sept. Henry Bowghcer or Bowrchier, earl of Essex, lord of Ewe and Lovayne, of Eyston ad Turrim, and Byley, Essex, and Brokkesbourne, Herts, 12 Oct. Wm. Antony, of London, beerbrewer, 2 Nov. Thomas ap Philip, of Mayrryng or Marryng parish in the lordship of Wentloke, South Wales, y., 5 Nov. Henry Baldewell, of Shurlowe, Suff., Walsham or Balsam, Camb., and Bayforde, Herts, gent., 12 Oct. John Broke or Brooke, late of Wykecraulht or Wycrouht, Devon, and Colyng, Kent, k., lord of Cobham, alias John Cobham of Cobham, k., s. and h. of Edward Broke, k., 12 July. Wm. Stanley, Standley or Standeley, of Hotton and Sturton, Chesh., esq. or k., 8 Nov. Nic. Dyker. of Salisbury and Guernsey, merchant, executor of Wm. Godfrey, late of Salisbury, draper, 9 Nov. Thomas Sibyll, Sibull or Sybell, of Furnyngham, Kent, esq., 7 Nov. John Garnet, Garnette, or Garneytt, of Huntingdon, draper or y., 10 Nov. Thomas Horde, Hord or Whord, of Brugenorth, Salop, gent., s. and h. of John and kinsman and heir of Thomas Hord, late of Brugenorth, esq., 10 Nov. Wm. Godfrey, of Norwich, worstedweaver, late master of the craft of worstedweavers there, 10 Nov. Walter Kebell, Kebyll, or Kebeell, gent., s. and h. of Thomas K., of Humberston, Assheby de le Zouch, and Kerby, Leic., and serjeant at law of Henry VII., 12 Nov. Laurence Bonvize, Bovize or Bonvise, merchant of Lucca and London, 12 Nov. Edmond or Egremund Broun or Browne, clk., rector of Laushull, Suff., undated. Thomas Copleston, of Armyngton, Ermyngton, and Exeter, Devon, esq., administrator of the goods of Richard Wode, of Ermyngton, Devon, esq., and Katharine his wife, late wife and executrix of the said Richard, 26 Nov. Robert Barnerd, master, and the College of Fodrynghey, 23 Nov. James Couper, Coweper or Cowper, of Sedbere or Sedbery, Yorks., y. or husbandman, 12 Nov. John Northecotys or Northecotis, g., King's receiver and keeper of the warren within the lordship of Warwick, late bailiff of Warwick and bailiff and receiver of rents of Snetterfeld, 26 Nov. Thomas Grenewod, Grenwodde or Grenwod, of Heptonstall in Halifax parish and Manyng[ham], Yorks., Ley Marston, Warw., and Assheby de Lazouche, Leic., y., labourer or husbandman, 6 Dec. John Newton, abbot, and the convent of Dieulacres, 28 Nov. Wm. Rysley, of Lyllyngston Lovell, Oxon., and Littulbery, Ntht., esq., 26 Nov. Guild of Holy Trinity within the church of St. Mary of Leuyton or Luton, Beds., 4 Dec. Henry Jeffrason, Jeferason, Geffreyson or Gefferason, of Gledall, Gledale, and Rypon, Yorks, y. or husbandman, 6 Dec. Laurence Bonvizo, Bonvize or Bonvise, merchant of Lucca and London 7 Dec. (Knoll). Edward Nayler, of Hereford, Bristol and Southwark, saddler, 4 Dec. Robert Horde, Hoorde, Hord, or Urde, of Boroughdon, Nthld., esq., 10 Nov. Andrew Furnes, Fornes or Fornys, of Newcastle upon Tyne, girdler, 10 Nov. Robert Bolnes, of Litlyngton, Camb., and Walsyngham, Norf., y. or husbandman, 22 Nov. John Hampden or Hamden, esq., s. and h. of John H., of Hampden, Bucks, and of Elizabeth Hampden, 12 Dec. Hugh Wombwell or Womwell, of Greysebrok and Stede, Yorks., esq., 11 Dec. Roger Bramston or Brampston, of Chepyngwicombe, and Estwicombe, Bucks, g. or chapman, 11 Dec. Edward Stradlyng, Stradelyng or Stradlynge, of Merthyn Mawre and Saynt Donet, in the county of Cardiff (sic) and Halswey, Soms., esq., s. and h. of Thomas, late lieutenant of Ogmore lordship and castle, under Maurice Saynt John, 29 Nov. John Jenney, clk., master or keeper of Brundyshe chantry, late warden of the chapel of Sogenhowe, executor of Eleanor Jenney (late wife of Wm. Jenney, knight), Robert Fynys, k., and Eleanor Fynys his wife, 9 Nov. Thomas Nevyll, Nevile or Nevell, of Holton in Saunton parish and Lekyngfeld, Yorks, Brauncepith, Dham., Styford, Nthld., Petworth, Surr. 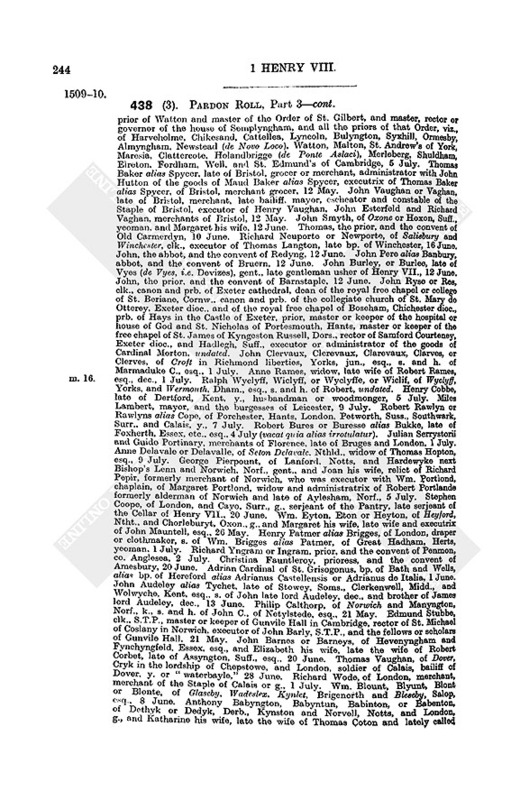 (sic), and Diwell, esq., 11 Dec. Thomas Prideaux, Predeaux, Predys or Predeux, of Orcharton or Orcheton, Devon, and London, g., 10 Dec. Thomas Coterell, Cottrell or Cotarell, of Wasshborne, Wayssheborne, Waissborne Water or Wasborne, Devon, g., and London, 12 Dec. John Pyte, Pett or Pette, of Ipswich and Haston, Suff., and Topcroft, Norf., y., 15 Dec. Wm._ (blank) Water, Atwaters or Atwater, of Conyngton, Soms., clk., rector of Dycheyate, Soms., S.T.D., of Magdalen College, Oxford, prb. and residentiary of the College of St. George of New Windsor, late chancellor of Lincoln, commissary of Cardinal Murton and dean of the chapel of Henry VII., 14 Dec. Richard Grey, of London, iremonger, one of the sons of Robert Grey, of Great Marlowe, Bucks, clothier, 16 Dec. Nic. Colyn, Goly, Golly, Golle, Gole or Colen, of Porreheste, Purrehest or Porrest, and St. Goron's parish, Cornw., franklin, captain of the Isle of Silla, or y., 19 Dec. John Smyth alias Swanborn, y., and John Lawe, baker, of Fenystratford, Bucks, executors of Roger Hebbys, late of Fenystratford, 5 Dec. Thomas Pytfyn, Pitfyn or Pittefeld, of London, Selby, Yorks, Myllydenhithe and Redyng, Berks, Marlowe, Bucks, and Westminster, stockfishmonger, y., innholder, mercer, hardwareman or fishmonger, 10 Dec. Robert Ladde, of Happesburgh, Norf., mariner, y., husbandman or labourer, 13 May. Walter Stubbe or Stubbes, of Heynford, Norf., and London, g., executor of Walter Haugh and John Dade, 13 May. Robert Reynold alias Glover, of Romsey, Hants, glover or y., 4 March. Rys or Richard ap Jevan ap Hoell, of Radnarsland or the lordship of Radnore, in the marches of Wales, g., 27 March. John Laurence alias Baker, of Lamehith, Surr., y., innholder or baker, 12 March. Thomas Kirkeby or Kyrkeby, of Bissetour, Fryngfourth and Oxford, Oxon., clk., 5 April. Thomas Wodenette, Wodnet or Woodnet of Sholdfleltt or Shaldflette in the Isle of Wight, and Shoreham, Kent, clerk or chaplain, 5 March (Knoll). Howell ap Howell or Hugh ap Howell, of Honyslade in St. Martin's next Bergevenny, yeoman or husbandman, 8 April. Wm. Feryby alias Coke, of Mendham, Fyrsyngfeld and Fersyngfeld, Suff., "coke" (cook), 15 April. Thomas Darcy, of Temple Hurste and Temple Newson, Yorks., and Rychmont, Surr., k., lord Darcy, captain of Berwick, and Edith his wife, late the wife of Ralph Nevyle, first born son of Ralph earl of Westmoreland, 26 Dec. Thomas Halle or Hall, of Leominster, Heref., and Crambroke and Tunbrigge, Kent, sherman, fuller, clothmaker or innholder, 10 April. John ap Rice ap Morice, of Kyrry lordship, Poweslond and Guyneslond in Wales, and Millenneth in the marches of Wales, g., 2 March. Richard Palmer, of Great Yarmouth and Lynn, merchant, 13 May. Chr. Arundell alias Armytt, or Armill, of Blomesbury, St. Clement's Danes, and Istelworth, Midd., yeoman, innholder or gent., 12 April. Owen Holand alias Owen ap John ap Howell Holant, of London, g., sheriff of Anglesey, 20 April. John Aleyne or Aleyn, of London, Thaxstede, Essex, and Chartesey, Surr., mercer or merchant, 20 April. John Haselwode, Hasilwode or Hasylwode, of Thaxstede, Essex, smith, bladesmith or y., 12 April. John Mason, Masoyn or Mayson, of Westhurrok, Essex, husbandman or y., 2 June. Edmond Harrewell, Horrewell or Harewell, of Besford and Coweley, Worc., esq., 14 April. John Gast, Gest or Geist, of London, pouchmaker or barber, 3 April (Knoll). Gerard Danyell, of London, fishmonger, 12 March. Edmond Rawley, Rayley, Raweleygh, Raleygh, Ralegh or Rawlegh, of Exeter, Plymmouth, Virdell and Stonehousse, Devon, and London, esq., 20 March. Thomas of the Vykerage alias Thomas Smyth of Vikerage alias Thomas Othevikerage, labourer, John Ferne, purser or pursemaker, and Thomas Glossop, barber, of Wyrkesworth, Derb., 16 April. Robert Sherbourne, bp. of Chichester, 1 May (cancelled). Richard Delabere, of Kyndnersley, Clehunger, Byndre and Hereford, Heref., k., 1 March. Richard Bekyngham. of Pudly Cote, Oxon., esq., 1 July. Richard alias John Gaynsford or Gaynesford, of Croweherst and Southwark, Surr., Byrlyng, Kent, London, and Twyneam, Suss., esq., s. and h. of John, and tenant of the manor of Poyle, 16 July. John Dawes, of London, grocer, 12 June. John Seynt John, rector, and the convent of Edingdon, 28 June. Richard Elyot alias Wever, of Beweley and Alley, Hants, weaver or husbandman, 15 July. Thomas Baldry, of London, mercer, executor of Thomas Wyndowte, alderman, John Style, mercer, Roger Grene, mercer, and John Bownde, draper, all of London, 18 July. Wm. Hanshawe, mayor, and the town of Gloucester, 16 June. Richard Rowedon, Roudon or Roudun, of Rowdun, Heref., Gloucester, and London, g. or mercer, alderman of Gloucester, or tailor, undated. Thomas Waren or Warren, fuller, and Ralph Waren, mercer or merchant, of London, 12 June. Nic. Seymer, of Dartmouth, Devon, and Waldon. Essex, merchant or mercer, undated. Augustine Spynula, Francis Pansano and James de Ponte, merchants of Genoa and London, 13 June. Thomas Gurney, of Bisshopiston in Stone parish, Bucks, husbandman or y., 14 June. Thomas Broune, or Browne, of Stoke Maundivile, Bucks, husbandman or yeoman, 19 June. John Champyon or Campyon, of Monkyng Rysburgh, Bucks, husbandman or y., 17 May. Thomas Went, abbot (? "Thomas Went Abbati monasterii," etc. 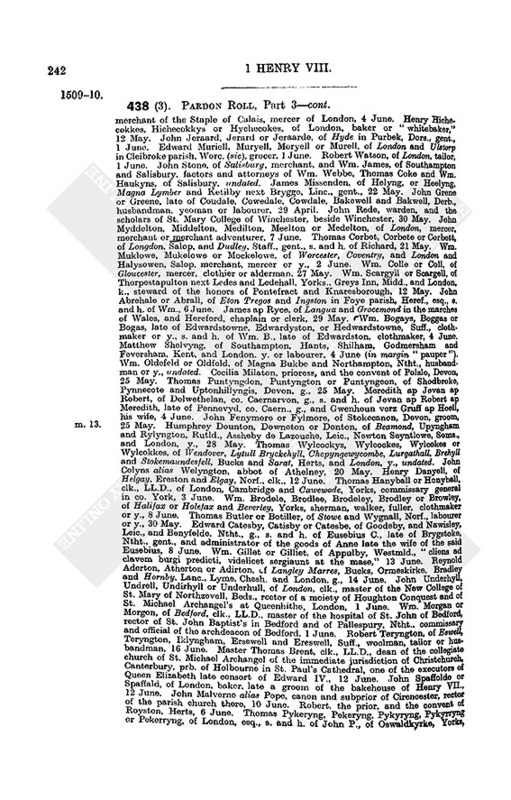 ), of Leyston, rector of Cheberton, Suff., alias Thomas of Cheberton, clerk, 21 June. Margaret Barty or Batry, of Colchester and Godstone, Essex (sic), widow of Robert B., late of Bassested or Barssested, Kent, undated. John Keme, of London, mercer, 16 June. Thomas Wodshawe, of Berkeswell, Warw., Southampton, Hants, and Stanlynche, Wilts, esq., late customer of Southampton, undated. Nic. Semer, of Dartmouth or Clyfton Dertmouth, merchant or mercer, 30 June. Wm. Adyngrobe, of Lurgessale, Bucks, gent., [30 June]. Hugh Gurgany, Gurgayn, Gorgayne or Goregane, of Dorton, Bucks, y. [30 June]. Eleanor Ogle, of Neweborne and Botell, Nthld., widow of George Parcy, esq., alias Eleanor Ogle, widow, late the wife of Ewin Ogle, late lord Ogle, and of Henry Raynsforth, executrix of William Hilton, k., 6 July. Thomas Drakys, clk., rector, and the fellows of Lincoln College, Oxford, 5 July. Humphrey Wellysburn, of Chepyngwycombe, Bucks, and Wallyngford, Berks, esq., and Margaret his wife, Arthur Wellysborn, gent., s. and h. apparent of Humphrey Wellysborn, and Ardewin Wellysburn, of Chepyngwicombe, gent., 9 July. Hugh Lother or Louthre, of Louthre and Hyghet, Cumb. (sic), k., 7 July. Thomas Beverley, of Carlisle, gent., and Joan his wife, 8 July. Roland Bukley or Bukeley, constable of the castle of Bowmares, co. Anglesea,' g. or esq., s. of Wm. Bukley, senior, of Bewmaris, esq., 20 June. Thomas Mychell, "irnemonger" of London, late of Wolverhampton, Staff., 10 July. Stephen Percy, of Snetisham, Norf., warner, husbandman or labourer, 7 July. John Genyns, of St. Andrew's in Holborne, London, tailor, 9 May. Maurice Glyne or Glynne, archdeacon of Bangor, alias Maurice Glyn, gent., alias Maurice ap Robert ap Meredyth ap Hulkyn Lloyt, and John ap Madok ap Howell, in co. Carnarvon, g., 10 May. John Colles or Colle, of Thelbrigge, Rowburgh and Northtawton, Devon, esq., 12 May. Wm. Wigston or Wygston, of Coventry, merchant of the Staple of Calais, 10 May. John Turbervyle, Turbervile or Turbervylde, of Bere Regis, Stokke and Sturmyster Marchall, Dors., London, and Lamehith, Surr., esq., 5 May. Thomas Yong, of London, and Wysburgh, Suss., saddler or labourer, 6 May. John Authorp, Awthorp or Austorp, of London, grocer, gent. or merchant, s. and h. of Wm. A., late of Petyrburgh, Ntht., 2 May. Wm. Lynd. Lynne or Lyne, of Suthwyk, Ntht., esq., ranger of Rokyngham Forest, 11 May. John Haryngton, or Heryngton, of Cartmell and Michelond in Fournes, Lanc., Carlisle, Cumb., and Kyrkby Kenall and Ellerlek, Westmld., London and Westminster, g., 10 May. Roger Philips or Phylyppys, of Shrewsbury, draper or g., 16 May. Thomas Martyn, of Salisbury and Wylton, Wilts., clk., doctor of decrees, official of the archd. of Salisbury, vicar of Wodford, Wilts, rector of Fugleston, Wilts, prb. of Cherdestoke, 20 May. John Marsham, of Norwich, grocer, 18 May. Richard Nicholason or Nicholasson, of Salisbury, hardwareman, 22 May. Wm. Thomas alias Wm. 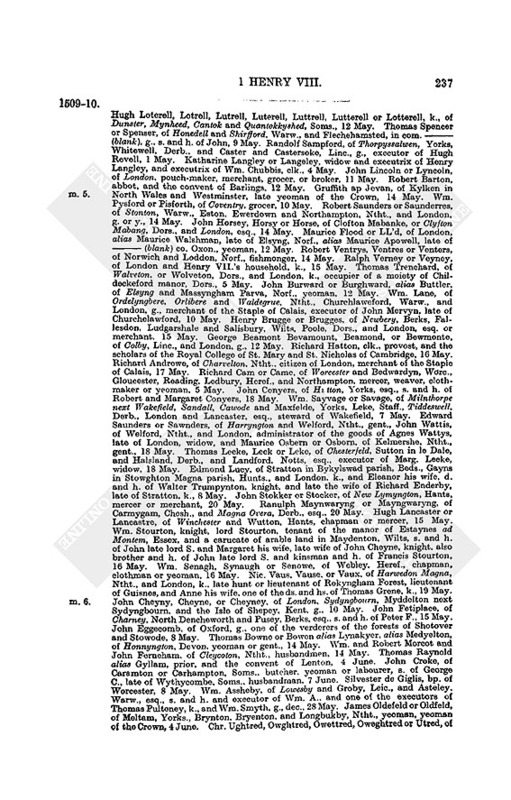 a Chamber or Achamber, of Stanes, Midd., Salisbury and Ambresbury, Wilts, and Shaftesbury, Dors., innholder or y., 20 May. John Grene, of Chelchehithe and Fulham, Midd., y. or husbandman, 18 May. Richard Wakeman, of Worplesdon, Asshe, St. Nicholas beside Guldeford, Westhorsley and Godalming, Surr., Hunnesdon, Essex, and Edelmeton, Midd., y. or groom, 18 May. Richard Alen or Aleyn, of Barfold, or Barfolt, and Chelmton. Suff., labourer or weaver, 10 May. Ranulph Gravenour, of Dewlapard, Salop, esq., Roger Kynaston, of Walford, Thomas Sowdeley of Ellerton, gent., John Pakynton of Stepull, gent., Humphrey Conyngesby of Nean Solers, gent., Thomas Acton, Acton Scot, gent., and John Ryso, of Hopton. franklin, collectors of an aid and subsidy from the laity of co. Salop, granted in 12 Hen. VII., 24 May. John Scrop, Scrope, or Scropp, of Bolton, Yorks, Foxton, Cumb., and Upsale, esq., 8 May. Thomas Wolverston, Wolfferiston, or Wolsferton, of Wolverston, Suff., and Colchester, Essex, esq., 9 May. Arthur Kemys and Anne his wife, and George Beamont and Joan his wife, kinswomen and heirs of Thomas Swynford, esq., s. and h. of Thomas S., knight, viz. daughters and heirs of Margaret sister of the said Thomas S., esq., 12 May. Edmond Clerk, of Welton, Walton and Wylloughby, Linc., husbandman, y., or labourer, 14 May. John Chapman, of Maidenbradley, Wilts, y., executor of Richard Chapman, of Maidenbradley, butcher, 28 May. Robert Bulkeley or Bulkley, of Burgate and South Chardford, Hants, and London, esq., 23 May. Thomas Seymour, Semer or Seymer, mercer or merchant of London, merchant of the Staple of Calais, executor of Christiana Semer. widow and executrix of John Semer, late of Walden, Essex, merchant, or of London, stockfishmonger. 12 May. Richard Potterton or Peterton, abbot of Notley, Bucks, undated. Elizabeth Ormeston, of Kyngeston, Camb., and London, widow, late wife of Roger Ormeston, k., alias Elizabeth Chamberleyn, of Berkyng, Essex, late the wife of Robert Chamberleyn, k., 13 May. Ralph Chamberleyn, of Kyngeston, Malketon and Dytton, Camb., and London, esq., and Elizabeth his wife. 17 May. Edward Chamberleyn, of Kyngeston, Camb., London, and Stratford, Midd., gent., 14 May. Robert Bayly or Baylly. of London, mercer, executor of Wm. Stede, alderman and grocer of London, 18 May. Edmond Grey, of Eton, Bucks, and London, lord of Wilton or W. "super Weyam," s. and h. of John Grey, k., late lord of Wilton, 14 May. Thomas Hawtrey, Hawtry. or "de Alta Ripa" of Ellysburgh, Bucks, esq., undated. Richard Haldesworth, S.T.P., LL.D., alias Robert Haldesworth, clk., commissary general in Worcester diocese, vicar general and chancellor of Silvester bp. of Worcester, 24 May. Edward duke of Buckingham, earl of Hereford, Stafford and Northampton, s. and h. of Henry, late Duke of B., alias Edw. Stafford, k., 24 May. Giles Basse or Bars, of Berkyng, Essex, and Westminster, y., 17 May. John John, alias John Davy, of Medmenham, Bucks, Durram, Yorks., and Southampton, Hants, husbandman, hatter or yeoman, 17 May. Edward Bolney, of Canterbury, Asshe, Pecham, and Chistlet, Kent, Hyrley, Suss., and Lamehith, Surr., g., brewer or draper, 8 June. Gregory Horne, of Farnham and Southwark, Surr., tailor, 20 May (pro Deo quia pauper). Edward Bulstrode or Bolstrode, of Hegeley and Upton, Bucks, and London, esq. (s. and h. of Richard Bulstrod), and Margaret his wife, late wife and executrix of John Asshefeld, esq., 21 May. Wm. Saxby or Sawsby, of Northampton, merchant, draper, merchant of the Staple of Calais, executor of Thomas Saxby, late of Northampton, dec., and of Elizabeth Saxby, votrix, and of Wm. Smyth, late of Calais, woolman, 1 June. John Ednam, clk., dean of Stoke next Clare, archd. of Taunton, almoner of Henry VII., rector of Fulmer, 20 May. John Calcot, of London, draper or merchant, 2 May. Anthony Fetyplace, of Swynbroke and Cornburye, Oxon., and London, esq., esquire for the Body, 2 June. Roger Lupton, provost of Eton college, rector of Braunspath and of Harlton, vicar of Cropredy, collector of arrears of the benevolence granted to Henry VII., surveyor of the lands of Windsor castle, 20 May. John Eyton, Eton or Heydon, of Midlyngton. Wodstoke and North Aston, Oxon., Astonton and Clee St. Margaret's, Salop, Barowe, Soms., and Roode, Northampton and Blysworth, Ntht., y. or gent., 27 May. Elizabeth Miller, late of Parva Marston, and Pottersrowe in Great Missenden, Bucks, singlewoman or spinster, 17 May. Thomas Surteys or Surtes, of Dedynsale within Sadberg wapentake, Dham., esq., s. and h. of Thomas, 19 May. Isabel Haryngton or Harryngton, of Wolfhege and Brekylsworth, Ntht., widow of James Harryngton, k., 16 May. Robert Tharold, Thorold or Thurrold, of Thursby or Thoresby, Linc., husbandman or yeoman, 20 May. Peter Fysshe or Fysche, of Scardeburgh, Yorks., merchant, 20 May. Thomas earl of Arundel. late lord Matravers (s. and h. of Wm. late earl of Arundel and warden of the Cinque Ports). warden or keeper of the New Forest, Hants, of the park of Claryngdon and forest of Groveley, Milchet and Bukhold, Wilts, and of the forest of Wolmer and Alisholt, Hants, undated. Ralph Mylnes, Milnes or Mylnys, of Brampton, Derb., yeoman, 20 May. Richard Marshall or Mershell, of Wetherall, Skelton, and Blynkowe, Cumb., smith or y., undated. John Sered, Serede or Serred, of Waltham Holy Cross, and Goodester, Essex, y.. 20 May. Ellis or Elisha Atturclyff, abbot, and the convent of Croxton, Leic., 14 May. John Weste, of London, mercer or merchant, 24 May. Stephen Flemmyng, of Moreinde, Ntht., esq., bailiff of the lordship of Higham Ferrers, 16 May. Edward Merson or Marson alias Gyde, of Wetherall, Flate and Langborough, Cumb., and Apulby, Westmld., piper, s. and h. of Robert Marson of Langborough, Cumb., husbandman, undated. Robert Broune, Broun or Browne, of Frampton, Dors., y. or husbandman, 16 May. Ralph Sykerlyng, Sykerlyn or Sykerlynde, of Sudbury, Suff., tanner or husbandman, 21 May. Isabel late wife and administratrix of the goods which were of Thomas Beauchamp, late of Croglyng, Cumb., junior, late s. and h. of Thomas B., senior, _ (blank) May. Wm. Everard, of Ponyngs, Suss., London, and Cratfeld, Suff., g., 16 May. Martin Flemmyng alias Leche, of Castelcombe, and Trobrige, Wilts., clothier or mercer, 16 May. 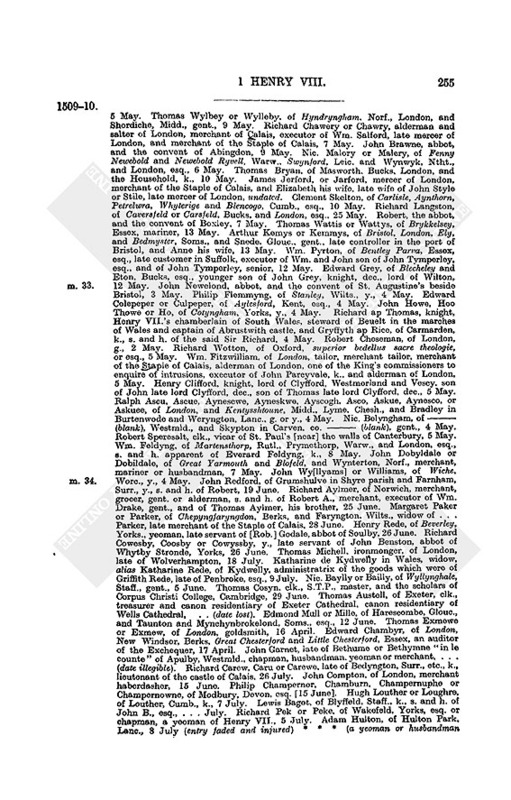 Thomas Rokley, Rokeley, Roklay or Rocley of Falthwayte, Rokley, Wyrkesburgh, Acworth, Sandall and Hanworth, Yorks., Overpadley, Derb., and Throwley, Staff., esq. or gent., 15 May. Robert Hayward, of Cleeve. Soms., gent. or schoolmaster, late of Oxford University scholastic, and of Taunton, yeoman, 15 May. Richard Pontysbury, Pontesbury or Ponsbery, merchant of the town of Calais, mercer of London, s. and one of the executors of Nic. P., late of Shrewsbury, mercer, 15 May. Isabel Muse, or Mewese. widow of Adrian Muse, late of Calais, 3 May. Thomas Crowker, master, and the brethren of St. Bartholomew's hospital in West Smithfield. Ralph Aleyn, Alayn or Alen. grocer or merchant of London, 4 June. John Loke, Lok or Look, mercer or merchant of London, 20 May. Richard Fetyplace or Fetiplace, of Est Shyflord and Besseley, Berks, and London, esq., 6 May. John Hansard, of Beverley, Yorks, and Owersby, Linc., gent., late servant of the abbots of Soulby and Croxton, 29 May. Wm. Spynk, Spynkke, Spyenk or Spenky, of London, grocer, 28 May. Edward Redeknap. of London, mercer, 8 June. Edmond Wotton and Richard Rokeby, mercers or merchants of London, 22 May. Richard Lee, of Padyngton in Alyngworth parish, Surr., husbandman or yeoman, executor of John Lee, his father, 5 June. Joan Legh, abbess of St. Mary's nunnery, Winchester, undated. 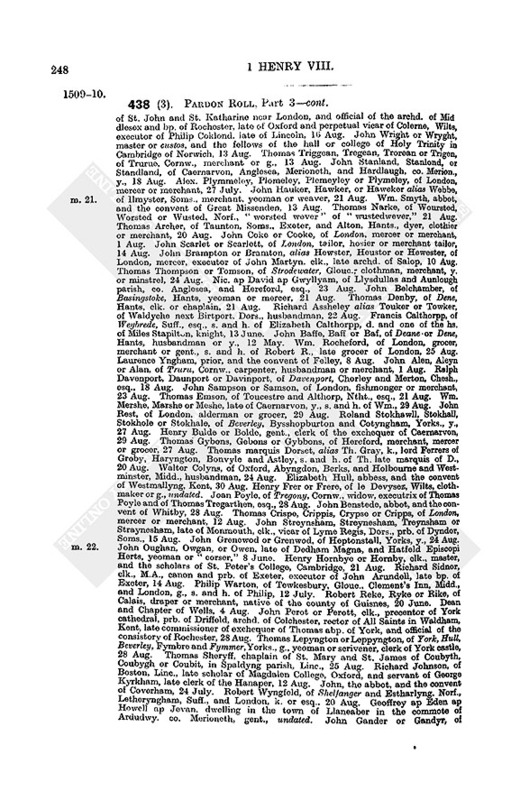 Robert Barker, or Berker, of Haunstaton or Hanstanton, Norf., yeoman, husbandman or labourer, 7 July. Henry Dorset, Dorsette or Doresette. of Salisbury, Wilts, Lye and Myllys, Soms., and Islyng, Kent, mercer, chapman or labourer, 3 July. Roger Haughton, of Becbury, Salop, St. Clement's Danes, Midd., and London, g., administrator of goods late of Richard Haughton. of Sweney, Salop, 10 July. Richard Kyng, of Bury St. Edmunds, merchant or mercer, executor of Wm. Maryot, late of Assheley, Camb., Thomas Edward, late of Forneham All Saints and Thomas Underhill, late of Lytyll Bradley, esq., 6 July. John Lympyn or Lympeny, of Exeter and Nytherey, Devon, gent., commissary of the Lord Admiral in the West, 9 July, John Strodewyke, Strodwyk or Strudwyke, of Wysebergh, Wyseborowe, Amelherst in Wysbourgh Grene parish, Amynhurste and Grene, Suss., yeoman or glassmaker, 3 July. Thomas Austell, clk., treasurer of Exeter cathedral, etc. (unfinished and cancelled). John Speke, of Whitlakyngion, or Wightlakyngton, Soms., and Exeter and Haywode. Devon, k., 20 May. Wm. Hampden, of Hartwell, Bucks, esq., 20 June. Wm. Sondis or Sonddis, of Woddam Ferres, Essex, g., and Margery his wife, s. and h. of John Serrard of Wrathisbury, Bucks, g., 8 May. John Holden, of London and Greenwich, draper, merchant or g., 10 June. Richard Copyngre or Copynger, of Little Walsyngham, Norf., and Bury St. Edmunds and Mildenall, Suff., innholder or y., 13 May. John James or Jamys, of London, baker or "corser," 25 May. Wm. Lawson or Lauson, of Cramlyngton, Nthld., junior, gent., 8 June. Thomas Felde, Folde, Feeld or Feld, of Potyslyppe, Glouc., g. or y., and Agnes his wife, late wife of Alex. Bradwey, late of Potyslyp, esq., 22 May. George Chaworth, Cheworth, Chawourth, Chawurth or Chauworth, of Annesley and Wyverton, Notts., esq., kinsman and h. of Thomas Chawurth, senior, esq., or kinsman and heir male of Thomas Chauworth, k., 12 May. Robert Sexten or Sexteyn, senior, of Lavenham or Lanam, Suff., and London, clothmaker, clothier or merchant, 19 May. Roger Martyn or Marteyn, of Melford or Longmelford. Suff., and London. gent., 12 May. Ralph Verney, of Pendoley, Herts, and Fletemarston. Bucks, esq., s. and h. of John Verney, knight, and of Margaret his wife, and now tenant of the manors of Salden, Donyngton, Permere, Stone, Forde, Pendeley and Middell Claydon, Bucks, 30 April. John Legh, Lee or Lye, of Stokwell [Surr. ], esq. (late executor of Ralph Legh, esq., and of Richard Culpeper, of Oxnoth, Kent), and Isabel his wife, undated. John Audelet or Audlet, of Berton and Abyngdon, Berks, yeoman, woolman or woodmonger. 3 May. Thomas Halys, of Henley upon Thames, Oxon., gent., merchant of the Staple of Calais, late bailiff of Rotherfeld Grey, Oxon. and Remnan, Berks, 30 April. John Prowde, of London, merchant haberdasher, 4 May. Thomas Langston, of Stowe Bucks, esq., 25 May. Geoffrey Middelton or Midelton, of Middelton in Londysdale, Westmld., esq., 5 May. Thomas Wylbey or Wylleby, of Hyndryngham. Norf., London, and Shordiche, Midd., gent., 9 May. Richard Chawery or Chawry, alderman and salter of London, merchant of Calais, executor of Wm. Salford, late mercer of London, and merchant of the Staple of Calais, 7 May. John Brawne, abbot, and the convent of Abingdon, 9 May. Nic. Malory or Malery, of Fenny Newebold and Newebold Ryvell, Warw., Swynford, Leic. and Wynwyk, Ntht., and London, esq., 6 May. Thomas Bryan, of Masworth, Bucks, London, and the Household, k., 10 May. James Jerford, or Jarford, mercer of London, merchant of the Staple of Calais, and Elizabeth his wife, late wife of John Style or Stile, late mercer of London, undated. Clement Skelton, of Carlisle, Aynthorn, Petrelwra, Whyterige and Blencogo, Cumb., esq., 10 May. Richard Langston, of Caversfeld or Carsfeld, Bucks, and London, esq., 25 May. Robert, the abbot, and the convent of Boxley, 7 May. Thomas Wattis or Wattys, of Brykkelsey, Essex, mariner, 13 May. Arthur Kemys or Kemmys, of Bristol, London, Ely, and Bedmyster, Soms., and Snede. Glouc., gent., late controller in the port of Bristol, and Anne his wife, 13 May. Wm. Pyrton, of Bentley Parva, Essex, esq., late customer in Suffolk, executor of Wm. and John son of John Tymperley, esq., and of John Tymperley, senior, 12 May. Edward Grey, of Blecheley and Eton, Bucks, esq., younger son of John Grey, knight, dec., lord of Wilton, 12 May. John Newelond, abbot, and the convent of St. Augustine's beside Bristol, 3 May. Philip Flemmyng, of Stanley, Wilts., y., 4 May. Edward Colepeper or Culpeper, of Aylesford, Kent, esq., 4 May. John Howe, Hoo Thowe or Ho, of Cotyngham, Yorks, y., 4 May. Richard ap Thomas, knight, Henry VII. 's chamberlain of South Wales, steward of Beuelt in the marches of Wales and captain of Abrustwith castle, and Gryffyth ap Rice, of Carmarden, k., s. and h. of the said Sir Richard, 4 May. Robert Cheseman, of London, g., 2 May. Richard Wotton, of Oxford, superior bedellus sacre theologie, or esq., 5 May. Wm. Fitzwilliam. 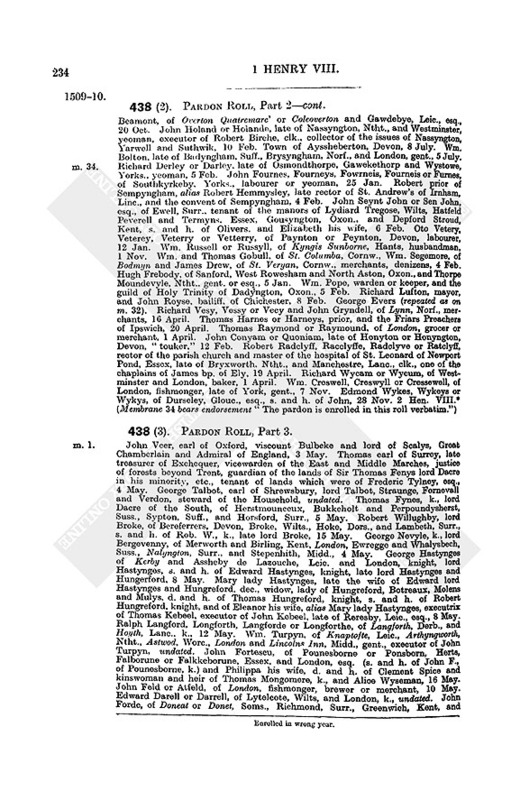 of London, tailor, merchant tailor, merchant of the Staple of Calais, alderman of London, one of the King's commissioners to enquire of intrusions, executor of John Parcyvale, k., and alderman of London, 5 May. Henry Clifford, knight, lord of Clyfford, Westmorland and Vescy. son of John late lord Clyfford, dec., son of Thomas late lord Clyfford, dec., 5 May. Ralph Ascu, Ascue, Aynescwe, Ayneskwe, Ayscogh, Asco, Askue, Aynesco, or Askuee, of London, and Kentysshtoune, Midd., Lyme, Chesh., and Bradley in Burtenwode and Weryngton, Lanc., g. or y., 4 May. Nic. Belyngham, of _(blank), Westmld., and Skypton in Carven, co. _ (blank), gent., 4 May. Robert Speresalt, clk., vicar of St. Paul's [near] the walls of Canterbury, 5 May. Wm. Feldyng, of Martensthorp, Rutl., Prymethorp, Warw., and London, esq., s. and h. apparent of Everard Feldyng, k., 8 May. John Dobyldale or Dobildale, of Great Yarmouth and Blofeld, and Wynterton, Norf., merchant, mariner or husbandman, 7 May. John Wy[llyams] or Williams, of Wiche, Worc., y., 4 May. John Redford, of Grumshulve in Shyre parish and Farnham, Surr., y., s. and h. of Robert, 19 June. Richard Aylmer, of Norwich, merchant, grocer, gent. or alderman, s. and h. of Robert A., merchant, executor of Wm. Drake, gent., and of Thomas Aylmer, his brother, 25 June. Margaret Paker or Parker, of Chepyngfaryngdon, Berks, and Faryngton, Wilts., widow of Parker, late merchant of the Staple of Calais, 28 June. Henry Rede, of Beverley, Yorks., yeoman, late servant of [Rob.] Godale, abbot of Soulby, 26 June. Richard Cowesby, Coosby or Cowyssby, y., late servant of John Benston, abbot of Whytby Stronde, Yorks, 26 June. Thomas Michell. ironmonger, of London, late of Wolverhampton, 18 July. Katharine de Kydwelly in Wales, widow, alias Katharine Rede, of Kydwelly, administratrix of the goods which were of Griffith Rede, late of Penbroke, esq., 9 July. Nic. Baylly or Bailly, of Wyllynghale, Staff., gent., 5 June. Thomas Cosyn, clk., S.T.P., master, and the scholars of Corpus Christi College, Cambridge, 29 June. Thomas Austell, of Exeter, clk., treasurer and canon residentiary of Exeter Cathedral, canon residentiary of Wells Cathedral, .. (date lost). Edmond Mull or Mille, of Harescombe, Glouc., and Taunton and Mynchynbrokelond, Soms., esq., 12 June. Thomas Exmewe or Exmew, of London, goldsmith, 16 April. Edward Chambyr, of London, New Windsor, Berks, Great Chesterford and Little Chesterford, Essex, an auditor of the Exchequer, 17 April. 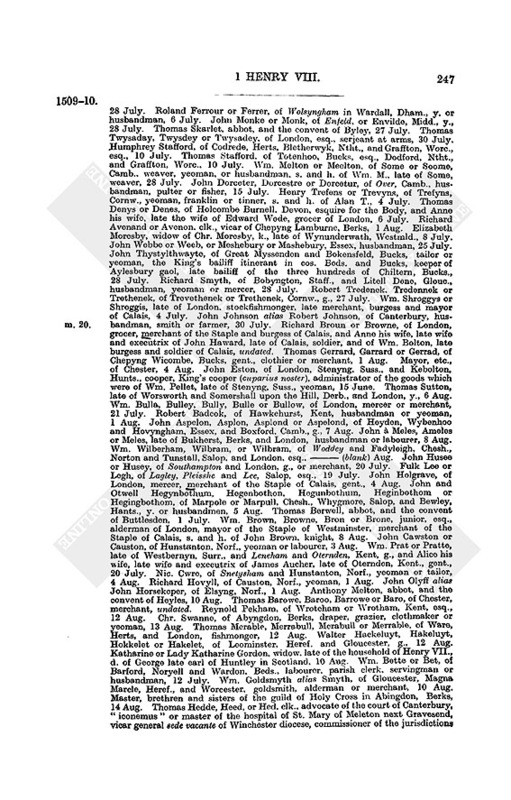 John Garnet, late of Bethume or Bethymne "in le counte" of Apulby, Westmld., chapman, husbandman, yeoman or merchant, ... (date illegible). Richard Carew, Caru or Carewe, late of Bedyngton, Surr., etc., k., lieutenant of the castle of Calais. 26 July. John Compton, of London, merchant haberdasher, 15 June. Philip Champernor, Chamburn, Champernuphe or Champernowne, of Modbury, Devon, esq. [15 June]. Hugh Louther or Loughre, of Louther, Cumb., k., 7 July. Lewis Bagot, of Blyffeld, Staff., k., s. and h. of John B., esq., ... July. Richard Pek or Peke, of Wakefeld, Yorks, esq. or chapman, a yeoman of Henry VII., 5 July. Adam Hulton, of Hulton Park. Lanc., 8 July (entry faded and injured) * * * (a yeoman or husbandman of some place in Northumberland, entry illegible). 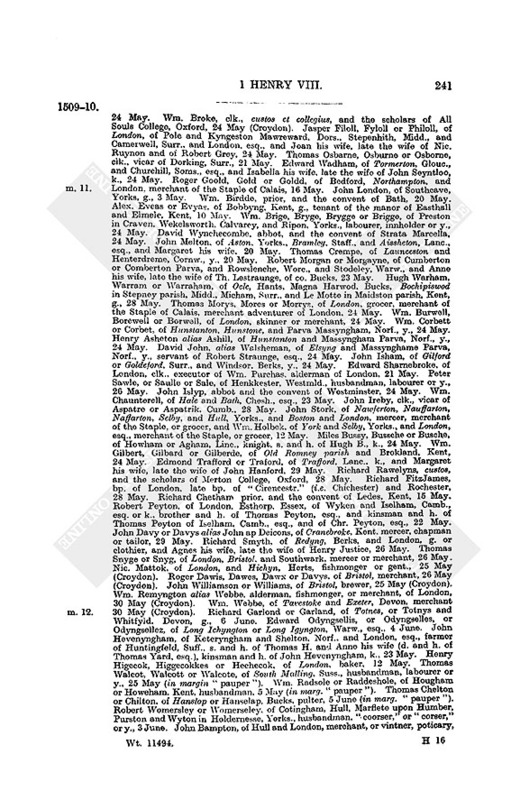 Robert ..., of Broughton, Yorks., husb[andman] (entry illegible). Wm. Potkyn, of London, gent., notary or scribe, ... of the debts which were of Thomas Warner, late of Teryngton, Norf., [executor] of Wm. Salford, late mercer of London (entry injured and date lost).